Wind is an abundant, broadly distributed, carbon-free energy source that may be converted into electricity with limited adverse environmen¬tal and social impacts. 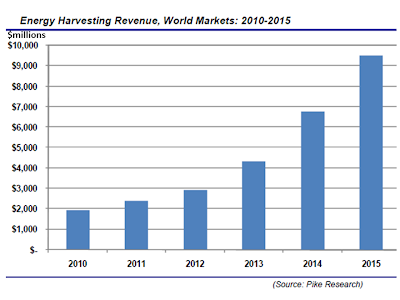 Deployment continues to expand rapidly despite varying growth rates for individual countries. U.S. and worldwide capacity exceeds 40 and 200 gigawatts (GW), respectively, more than 10-fold increases since 2000. Wind turbines currently account for about 1% of global electricity production, 5% in the European Union, more than double that in Portugal and Spain, and almost 20% in Denmark. They represent the leading source of load-serving non-hydro renewable generation in the United States, as shown in Figure 1. Wind’s growing contributions have been driven by two interconnected factors. 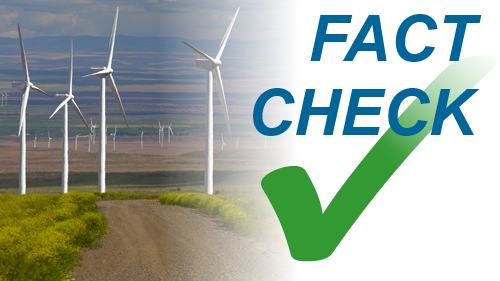 Government actions have mandated additions of renewable generation capacity and made investments in them attractive, while ever-larger turbines incorporating increasingly sophisticated conversion and control systems have made land-based wind an economical central-station supply option in many areas. The U.S. experience highlights the influence of government support mechanisms: Capacity additions from 2000 through the present have followed a “boom and bust” cycle, track¬ing the availability of tax credits and, more recently, cash grants. U.S. and international agencies have advanced ambitious visions for future onshore and offshore deployment to help satisfy burgeoning elec¬tricity demand while meeting climate stabilization objectives. Targets for 2030 include 20% of U.S. and 9% of global electricity generation, which would position wind as the largest source of supply-side reductions in greenhouse gas emissions over this period. 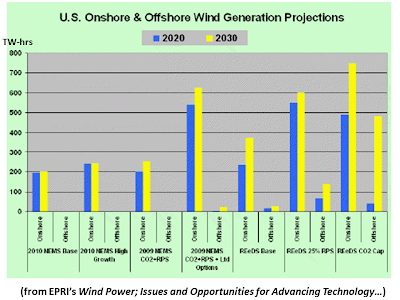 Through 2050, goals are for at least 400 GW of U.S. capacity and about 2,000 GW worldwide. The high levels of government support that have helped fuel capacity expansion are unlikely to be sustained indefinitely, challenging the wind power industry’s ability to meet these deployment targets. With natural gas prices expected to remain low, variable-output wind already faces stiff competition from combined-cycle plants. The fight for market share is likely to intensify after 2030, when new nuclear plants and fossil plants with carbon capture and storage capability are expected to be available for widespread baseload duty. 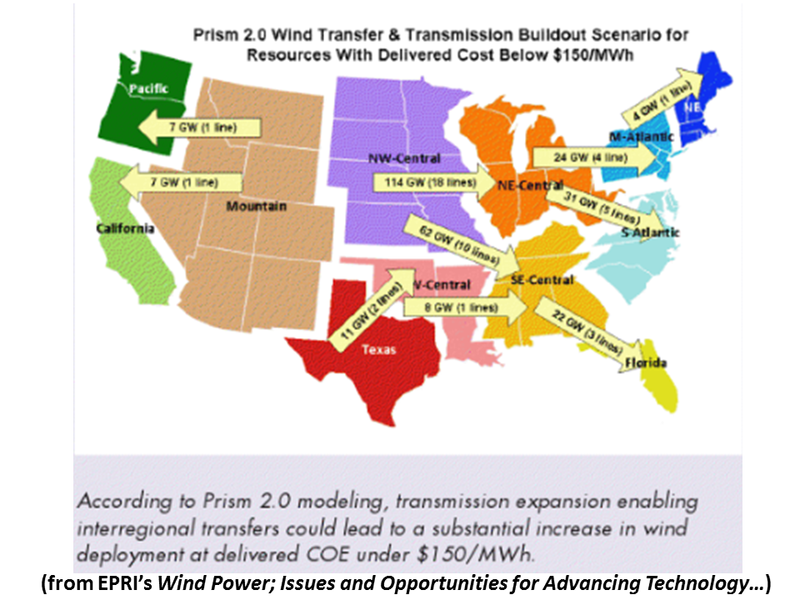 To maintain competitiveness in the face of declining subsidies, EPRI estimates that the wholesale levelized cost of energy (COE) from land-based wind must be at least 20% lower by 2030 than it is today, and cost reductions of 25% or higher are required for offshore projects. To achieve grid parity in the absence of subsidies, COE decreases of at least 25% on land and 50% offshore likely are necessary through 2050. Advanced technologies are needed for reducing capital costs and opera¬tions and maintenance (O&M) expenses and for increasing capacity factors, all of which will contribute to a lower COE at the busbar. In addition, deployment, interconnection, and integration challenges must be addressed in order to install large amounts of wind power, transmit energy from remote areas to load centers, accommodate variable genera¬tion at penetration levels above 20%, and thereby minimize wind’s delivered COE. This paper focuses on research, development, demonstration, and deploy¬ment (RDD&D) issues consistent with expanding wind’s worldwide role in serving consumer demand at low cost in a clean, reliable, and sustainable manner. It identifies opportunities for cost-performance improvements in resource assessment, energy capture, O&M, transmis¬sion, grid operations and planning, project development, and impact mitigation. Based on EPRI’s technology assessments, this paper also highlights RDD&D priorities that individually promise the greatest sav¬ings and productivity gains and together foretell “super turbines” capable of achieving aggressive cost, performance, and deployment targets. Modern wind turbines convert the kinetic energy of moving air into mechanical energy and then electricity. They harness wind created by the differential heating and cooling of the Earth’s surface, the passage of fronts and storms, and other phenomena. As shown in Figure 2, they employ a three-bladed rotor spinning around a horizontal axis. The rotor is connected to a drive train, generator, and control systems contained within a nacelle that sits atop a tower and rotates on a vertical axis to orient blades into the wind. Grid-connected turbines may be deployed over all scales, from individual residential and commercial units rated in the kilowatts (kW) and supplying on-site energy, to wind farms incorporating hundreds of multi-megawatt (MW) machines that generate bulk power to serve load. This white paper focuses on central-station applications. For individual regions and countries, both wind development activity and deployment potential depend on resource availability, a given site—the major determinant of capacity factors and project economics—largely is a function of both the average wind veloc¬ity at hub height and the wind speed frequency distribution. Wind resources are classified based on mean power density (in W/m2) or equivalent speed (in m/s or mph) at a specified height above the Earth’s surface, ranging from 1 (the worst) to 7 (the best). Class 3 and better resources—average wind speed of at least 6.9 m/s at 80 m above the surface—generally are required for economical grid-connected wind generation. As shown in Figures 3 and 4, open plains, mountain ranges, coastal areas, and offshore environments offer site-specific development opportunities in many regions of the United States and around the world. Currently, wind projects benefit from high levels of government support because they generate power without requiring energy im¬ports, depleting finite fuel supplies, releasing air pollution, emitting greenhouse gases, or producing liquid and solid wastes. Renewable portfolio standard (RPS) mandates, investment and production tax credits, direct grants, and feed-in tariffs represent common support mechanisms. Climate policies that increase the cost of electricity from fossil power plants also improve the competitiveness of wind generation. 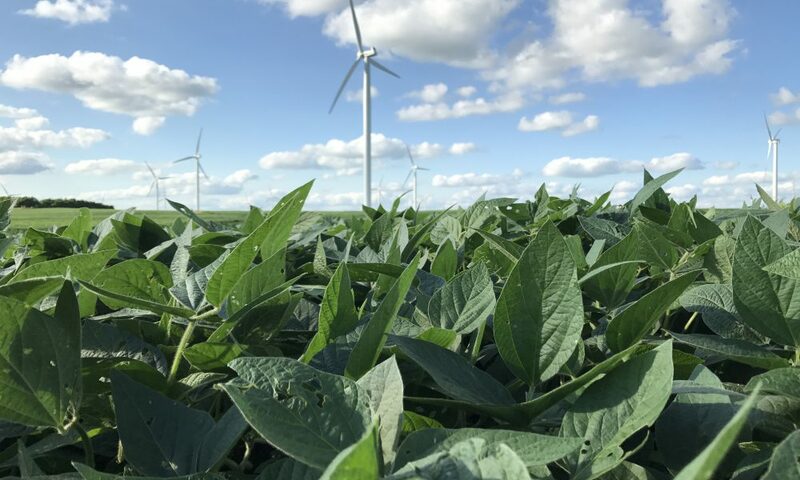 In the “20% Wind Energy by 2030” study supported by the U.S. Department of Energy (DOE), REeDs analyses indicate that 300 GW of wind could supply 20% of U.S. electric demand in 2030. (DOE, 2008) NREL’s ongoing “Renewable Energy Futures” study—which considers the technical feasibility of having renew¬able generation options supply up to 80% of electricity needs in the continental United States by the middle of this century—includes REeDs scenarios in which installed wind capacity ranges from about 400 to 600 GW and accounts for 32 to 44% of U.S. needs in 2050. (NREL, in press) The International Energy Agency (IEA) envisions global wind deployment of more than 1,000 GW by 2030 and 2,000 GW by 2050, supplying 9 and 12% of the world’s electric-ity requirements, respectively. 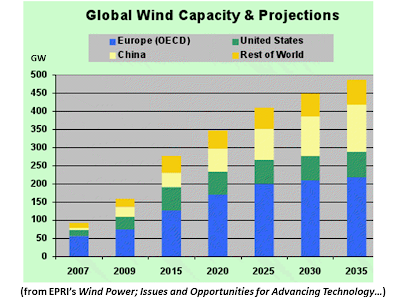 (IEA, 2009) Projections by the wind industry are even more optimistic. For aggressive deployment targets to be achieved, wind power will need to be cost-competitive with energy from other genera¬tion options at the wholesale level, in the absence of subsidies, and in a broad range of markets. 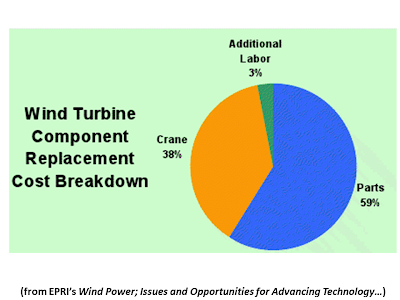 This will require continued progress in wind turbine and other technologies, a selection of which are shown in Figure 7. Already, land-based wind offers advantages as a mature, low-risk, non-emitting renewable energy technology. 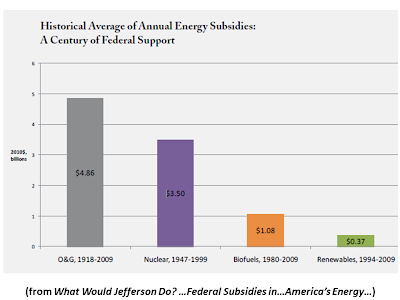 At current subsidy levels, central-station projects are highly competitive in many U.S. markets, even though installed costs have increased to about $1,750/kW from less than $1,500/kW several years ago. (EPRI, 1021379; EPRI, 1019772) These increases have been driven primarily by supply constraints associated with the rapid expan¬sion in deployment and by rising prices for steel, concrete, copper, and other materials. Recent growth in the number and capacity of turbine manufacturers has addressed some—but not all—supply is¬sues. Meanwhile, effects on wholesale COE have been offset in large part by deployment and production incentives, as well as increases in capacity factors attributable to technological advances and reli¬ability improvements. High O&M costs for installed capacity are a continuing concern. As components age, outage and failure rates increase for gearboxes, blades, and other components. Technologies for increasing energy capture and for reducing inspection and repair expenses, productivity losses, and replacement power costs represent high-priority RDD&D needs. Shallow-water offshore wind has only about a decade of commer¬cial experience. Because components must be ruggedized for and installed in difficult environments and turbines must be connected to each other and the grid with undersea cables, the distribution of costs differs from that of land-based projects (Figure 8 and 9). Offshore capital costs are roughly double, and O&M expenses are several times higher as well. On the plus side, better wind resources lead to higher capacity factors, and offshore environments offer economies of scale through larger turbines and bigger projects. Nonetheless, the average wholesale COE from shallow-water offshore wind remains substantially higher than that for land-based turbines. Technologies for greater water depths are not commercially available. Fixed support structures and floating platforms suited for these applications are RDD&D priorities. Transmission interconnection and grid integration are critical tech¬nical issues influencing future wind deployment. Many areas with outstanding resources are remote from load centers, creating the need for new transmission capacity, system upgrades, advanced tech¬nologies, and novel planning and cost allocation strategies. Once deployed, individual turbines and projects generate output that var¬ies across all time scales and is often poorly matched with load, yet they must be integrated in an infrastructure designed to maintain reliability while instantaneously and continuously balancing produc¬tion with consumption across a wide geographic area. Operating experience and modeling studies generally indicate that wind power may be accommodated without significant impact at penetration levels, on an energy basis, of about 10 to 20% in individual control areas. 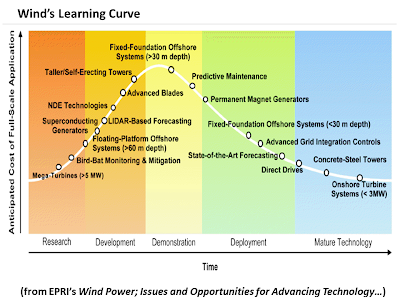 At higher generation fractions, integration challenges relating to regulation, load following, and scheduling de¬pend on the correspondence between wind output and load profile, the grid support capabilities available at turbine and project levels, the characteristics of other power plants, and additional factors. Maintaining adequate backup and high levels of reliability imposes new demands on existing fossil assets and requires additional fast-response generation capacity to supply reserve services, as well as creates the need for innovations in forecasting, situation awareness, power electronics, storage, and other technologies. 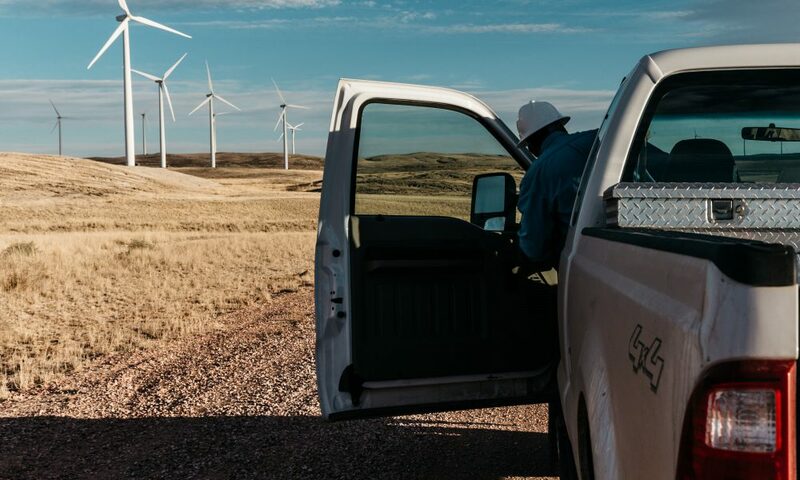 Interconnection and integration requirements increase wind’s deliv¬ered COE, while environmental and social considerations also come into play in wind project development and operations. Utility-scale wind farms require a substantial footprint. This may create siting challenges, mitigated by the fact that turbines and other infrastruc¬ture occupy only a small portion of a project’s area and thus do not exclude other uses. 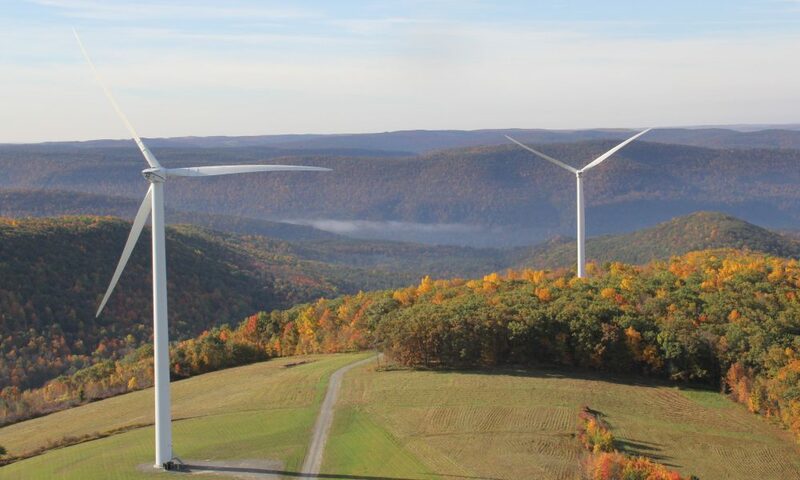 Turbines deployed along ridge lines, in open landscapes, and near coastlines and other population centers may be highly visible, engendering opposition. Potential impacts on birds, bats, and additional wildlife may create constraints on siting and op¬erations. Noise, shadow flicker, radar interference, property values, and other concerns may as well. Improved knowledge and advanced mitigation strategies are needed for both onshore and offshore ap-plications. 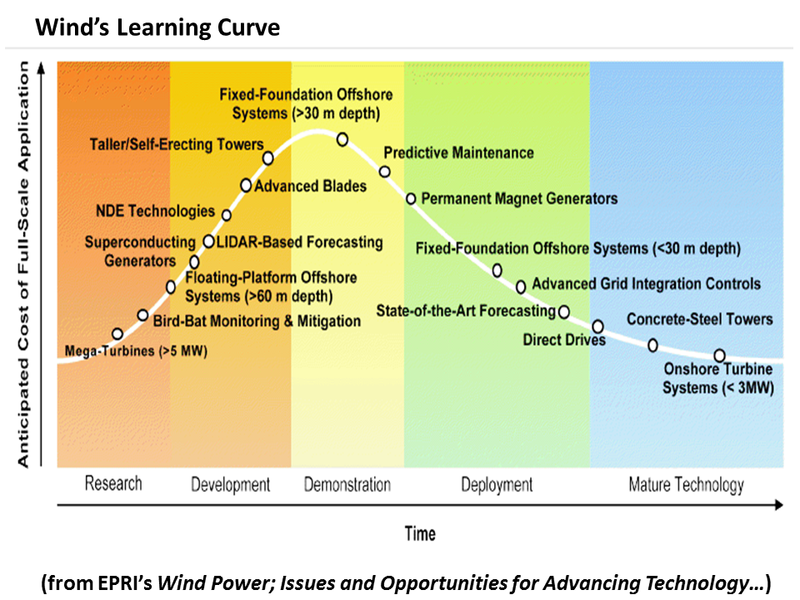 • Technical, political, environmental, and social issues will pose challenges to deployment as wind penetration expands. 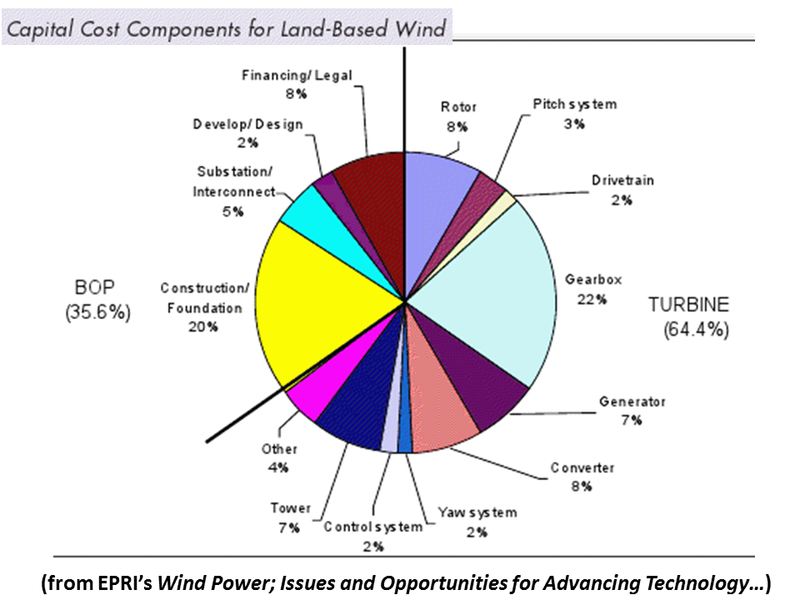 To improve wind’s competitiveness with other generation options and grow its role in meeting domestic and global energy needs, advances will be needed in tower and foundation, blade and rotor, drive train and power electronics, O&M, transmission intercon¬nection, grid integration, siting and development, and impact mitigation technologies. To reduce costs, increase productivity, and enhance environmental performance, substantial and sustained RDD&D investment will be required. Megawatt-scale wind turbines are proven solutions for generating large amounts of carbon-free power with minimal adverse envi¬ronmental and social impacts. Consistent with wind power’s track record, the massive global resource base, and existing and antici-pated policy objectives, international and U.S. energy agencies have set extremely ambitious wind deployment goals across the next 2 decades and through 2050. The actual pace and extent of future additions of onshore and offshore wind capacity will depend less on resource characteristics than on technological progress, political and regulatory decisions, and additional drivers that together will influ¬ence the wholesale and delivered COE from future wind projects. 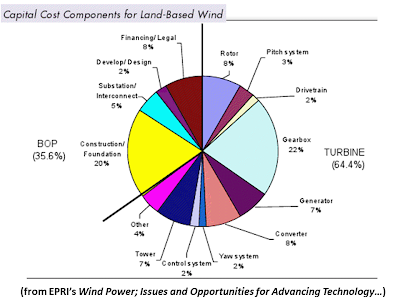 According to EPRI’s analyses, land-based wind resources are suf¬ficient to meet more than 50% of future U.S. electricity needs at a wholesale COE of about $80 to $90/MWh. However, wind’s competitiveness will be determined by fuel prices, climate policy and RPS mandates, and other factors influencing the economics of power generation options, while the challenges associated with integrating huge amounts of variable-output generation may pro¬duce sharp increases in delivered COE. Further, today’s incentives are not likely to be sustained indefinitely, project financing is scarce, the economics of harnessing higher-quality offshore wind resources remain daunting, and siting and permitting challenges are expected to continue. These cost, interconnection, integration, and develop¬ment issues apply in the United States and around the world. 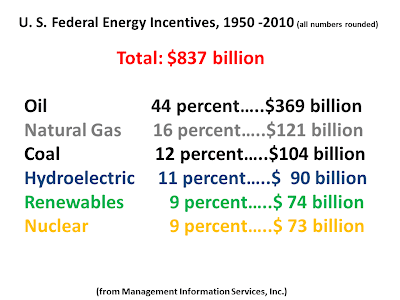 Based on goals set by U.S. and international energy agencies and its own analyses, EPRI has established the cost-performance targets outlined in Table 1. These 2030 and 2050 targets are designed to ensure that both onshore and offshore wind power become increas¬ingly competitive in the face of declining subsidies, ultimately achieving grid parity. Meeting them will require substantial and sus¬tained technological progress to increase capacity factors and reduce capital and O&M expenses, all of which will contribute to higher productivity and a lower COE at the busbar. 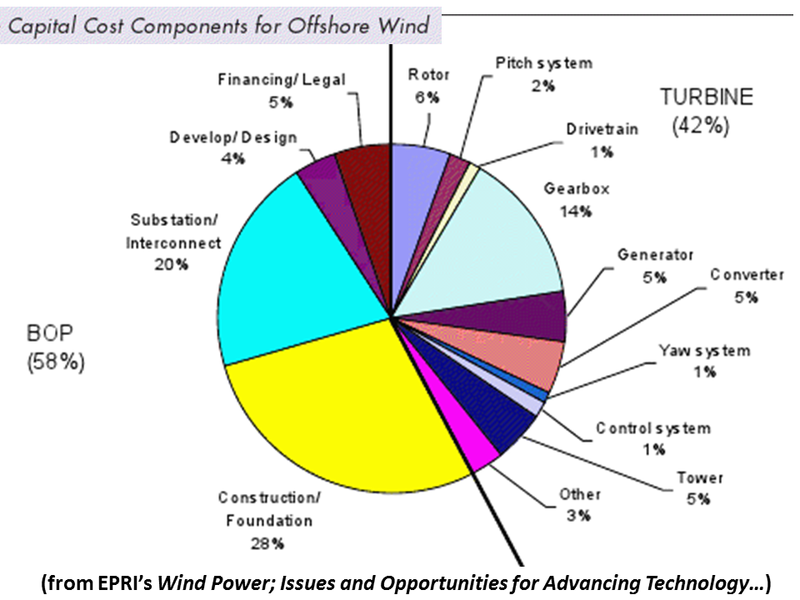 Advances in wind turbine components and systems are not enough, however. 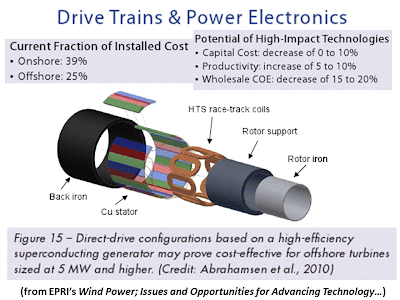 Wind interconnection and integration innovations are needed to reduce wind’s delivered COE by providing access to abundant resources in remote areas, delivering large amounts of power over long distances to load centers, and accommodating variable-output generation at penetration levels well above 20%. In addition, new project development and impact mitigation technologies are necessary to decrease up-front costs and risks, as well as potential environmental and social concerns. Also listed in Table 2 are the highest-priority transmission intercon¬nection and grid integration technologies. Energy storage systems and probabilistic operations and planning tools have the greatest potential to both facilitate high penetration levels and minimize impacts on power system reliability, other generating plants, and wind’s delivered COE. Advanced forecasting, high-voltage power electronics, and inter-area management tools offer significant inte¬gration benefits, while HTS cables and HVDC systems are critical for long-distance bulk power transmission between remote wind resource areas and load centers. Generally, the advanced components, systems, and tools identified as RDD&D priorities in Table 2 are not mutually exclusive. 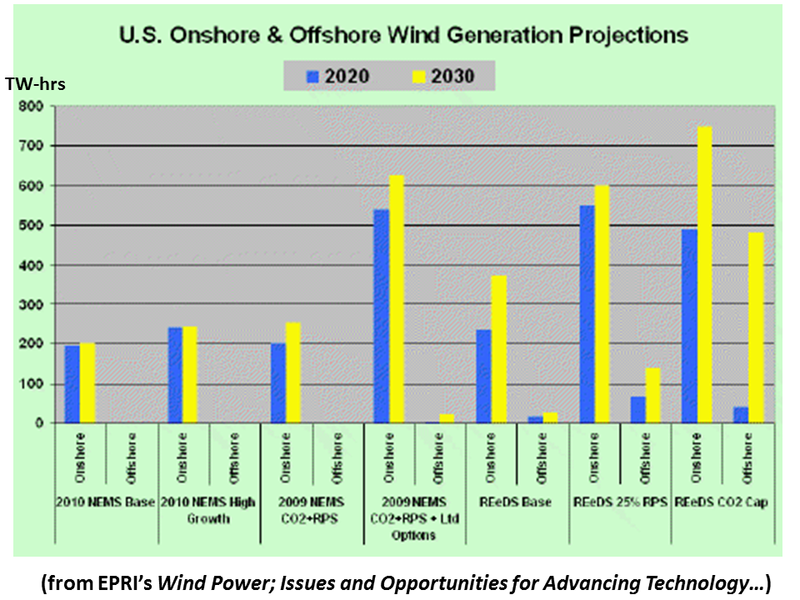 In fact, “super turbines” integrating multiple advanced technologies and feeding power to an expanded, more robust, and more flexible transmission grid will be required to achieve the cost-performance targets shown in Table 1, as well as deployment goals such as 20% of U.S. generation and almost 10% of global generation by 2030 and at least 400 GW of U.S. wind capacity and about 2,000 GW worldwide by 2050. (DOE, 2008; IEA, 2009; NREL, in press) Fig¬ure 30 displays two possible “super-turbine” configurations expected to emerge within the next decade. 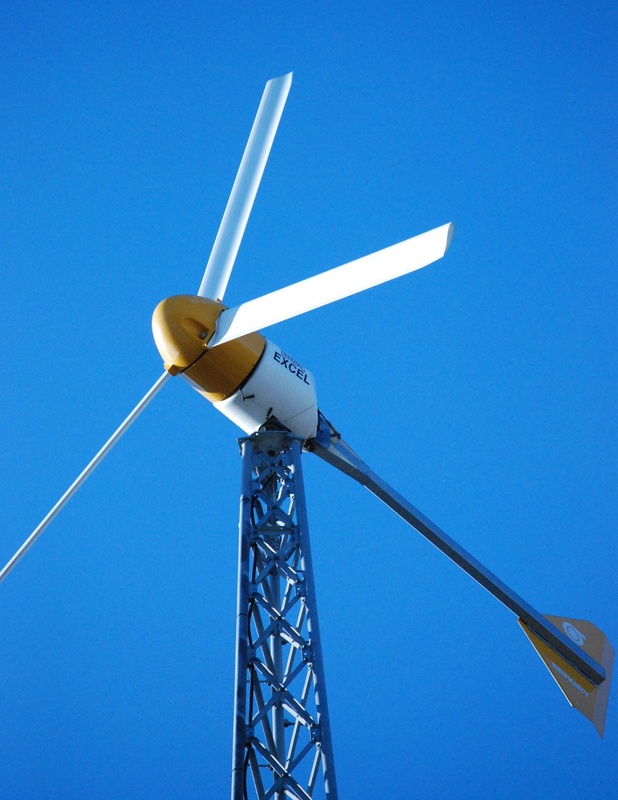 Land-based machines likely will have a minimum capacity of 3 MW and incorporate large-diameter rotors, segmented blades with active aerodynamic controls, direct-drive PM generators, and hybrid concrete-steel towers at least 120 m high to allow economical generation in low-wind environments. Offshore, 5- to 10-MW turbines likely will employ towable gravity foundations or floating platforms with dynamic balancing sys¬tems, and smart blades will serve low-speed HTS generators at hub heights influenced more by rotor diameter than the need to avoid wind shear and turbulence above the water surface. 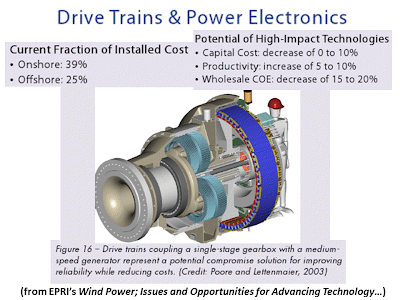 Power electron¬ics, sensing, control, forecasting, HMS, NDE, and other innova¬tions will further improve the performance of individual turbines and entire projects. Of course, meeting ambitious wind capacity expansion and genera¬tion objectives also is contingent on getting projects sited, permit¬ted, financed, and built and then operated with minimal adverse environmental and social impacts. Priorities include better resource characterization and site assessment methods, improved understand¬ing of wildlife interactions, advanced impact mitigation technolo¬gies, and streamlined permitting and approval frameworks. 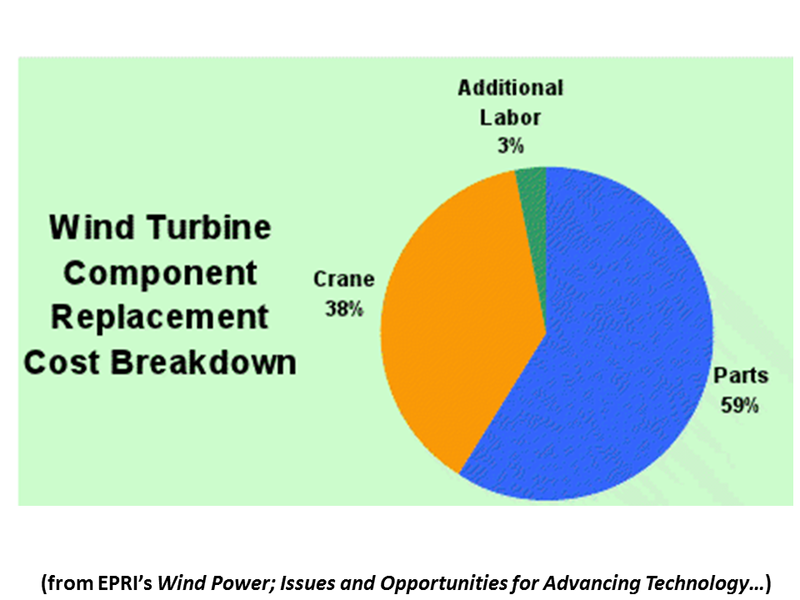 EPRI is conducting research to help grow the role of wind energy technologies in cost-effectively meeting demand, diversifying supply portfolios, satisfying renewable energy mandates, and responding to climate change and security concerns. In addition, EPRI is collabo¬rating with utilities, government agencies, and other stakeholders to ensure that RDD&D priorities for the immediate, mid, and longer terms are being addressed. "Chinese solar companies are considering shifting manufacturing to other countries to avoid paying tariffs that may result from a trade complaint. "LDK Solar Co. (LDK) and JA Solar Holdings Co. (JASO) said they may move some production operations if the U.S. imposes duties on solar products imported from China. 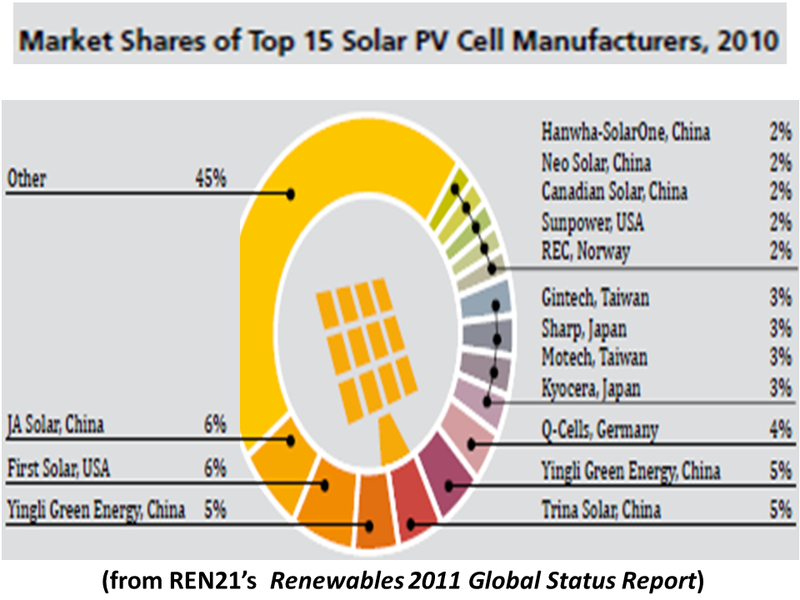 Suntech Power Holdings Co. (STP), the world’s biggest solar-panel maker, said the dispute would be ‘extremely damaging to the entire U.S. solar industry.’ …The statements…show that Chinese manufacturers are developing strategies to avoid potential duties, and that the complaint may not give U.S. solar companies the relief they’re seeking…"
"Chinese companies may avoid the tariffs by buying solar cells from Taiwanese companies and assembling them into modules outside China…Suntech and Canadian Solar Inc., which makes panels in China, already have plants in North America, and JA Solar has an existing relationship outside China with a company to which it could outsource some manufacturing. "SolarWorld Industries America Inc…and six unnamed U.S. manufacturers filed the trade complaint last month with the U.S. International Trade Commission and Commerce Department, asserting that import duties on Chinese imports will compensate for unfair financial support China provides to its solar industry…The U.S. imported $2.4 billion of solar panels from China in 2010…A tariff would increase prices for developers, homeowners, utilities and others who purchase solar panels in the U.S…[Analysts expect] the trade complaint will pass and tariffs will be imposed…"
"Continued overcapacity in the solar supply chain will see the cut-throat competition in the solar PV supply-chain continue, with average selling prices for modules continuing to fall at least for the first part of 2012. Not until 2014 will market conditions improve markedly…"
"…[M]arket growth in 2015 will be increasingly dominated by utility scale projects…[D]ecreases in equipment prices will make solar power cost competitive in certain areas toward the end of the forecast period…The West will remain the largest regional market…California and New Jersey will be the single most important states…even if both states will face intermittent market disruption…"
"The region is poised to grow an additional 45% in 2012, as Asian governments introduce new installation targets. 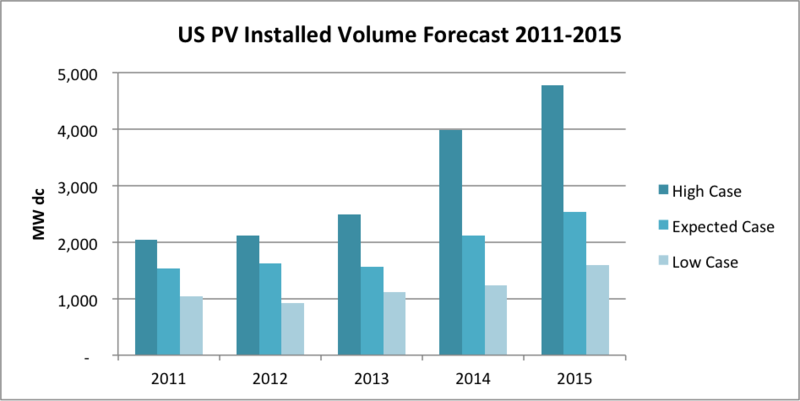 China's National Energy Administration recently revised its official cumulative solar installation target up from 10 GW to 15 GW for 2015, representing just one of the most recent examples. China is projected to account for 45% of regional demand in Q4'11 and is on course to surpass both the US and Japanese market sizes in 2011." "Elsewhere, regional demand is being driven by national incentive programs in India, while Japan is also growing rapidly ahead of its new FIT program. 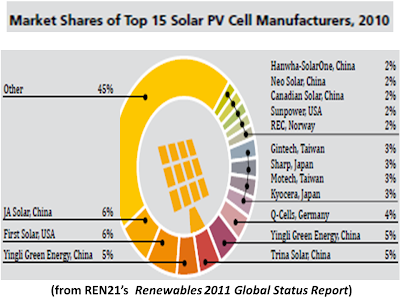 Other emerging markets in the region such as Taiwan, South Korea, Thailand, and Malaysia are projected to deliver a combined 700 MW of additional demand in 2012. "Non-residential ground mount systems are projected to account for 64% of the regional market by Q4’12, up from just 16% in Q1’11. 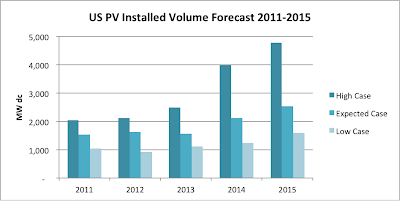 This share growth will come at the expense of the residential segment which falls from 58% in Q1’11 to just 20% by Q4’12…Internal rates of return (IRRs) on PV systems in the four major markets will build over the next four quarters, ending 2012 at levels between 10% and 13%, as system prices drop faster than incentive rates…"
In 2005, the nation’s thermoelectric power plants—which boil water to create steam, which in turn drives turbines to produce electricity—withdrew as much water as farms did, and more than four times as much as all U.S. residents. That means lighting rooms, powering computers and TVs, and running appliances requires more water, on average, than the total amount we use in our homes—washing dishes and clothes, showering, flushing toilets, and watering lawns and gardens. • The 2011 drought in Texas created tension among farmers, cities, and power plants across the state. At least one plant had to cut its output, and some plants had to pipe in water from new sources. The state power authority warned that several thousand megawatts of electrical capacity might go offline if the drought persists into 2012. • As drought hit the Southeast in 2007, water providers from Atlanta to Raleigh urged residents to cut their water use. Power plants felt the heat as well. In North Carolina, customers faced blackouts as water woes forced Duke Energy to cut output at its G.G. Allen and Riverbend coal plants on the Catawba River. Meanwhile the utility was scrambling to keep the water intake system for its McGuirem nuclear plant underwater. 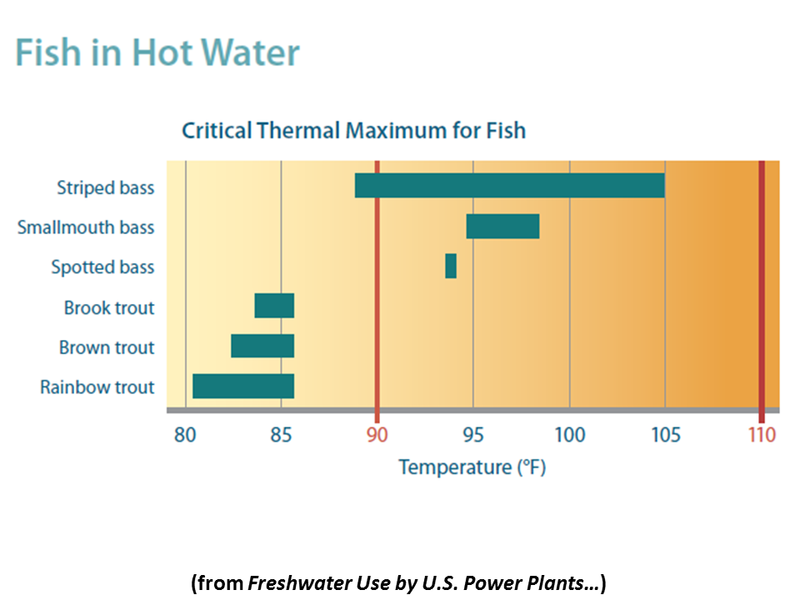 In Alabama, the Browns Ferry nuclear plant had to drastically cut its output (as it has in three of the last five years) to avoid exceeding the temperature limit on discharge water and killing fish in the Tennessee River. • A 2006 heat wave forced nuclear plants in the Midwest to reduce their output when customers needed power most. At the Prairie Island plant in Minnesota, for example, the high temperature of the Mississippi River forced the plant to cut electricity generation by more than half. • In the arid Southwest, power plants have been contributing to the depletion of aquifers, in some cases without even reporting their water use. • On New York’s Hudson River, the cooling water intakes of the Indian Point nuclear plant kill millions of fish annually, including endangered shortnose sturgeon. This hazard to aquatic life now threatens the plant as well. 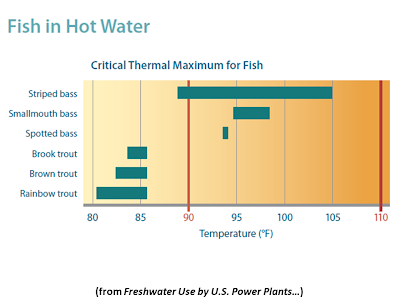 Because operators have not built a new cooling system to protect fish, state regulators have not yet approved the licenses the operators need to keep the plant’s two reactors running past 2013 and 2015. • Proposed power plants have also taken hits over water needs. Local concerns about water use have scuttled planned facilities in Arizona, Idaho, Virginia, and elsewhere. Developers of proposed water-cooled concentrating solar plants in California and Nevada have run into opposition, driving them toward dry cooling instead. 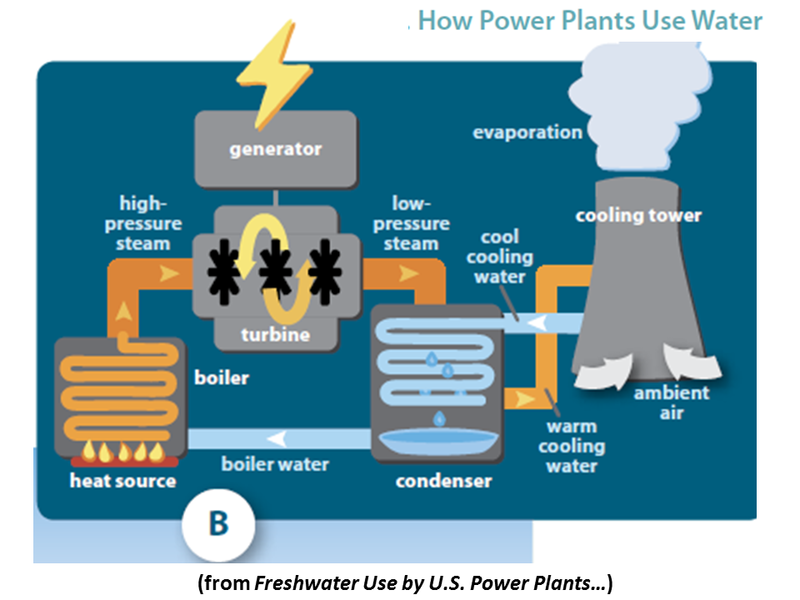 This report—the first on power plant water use and related water stress from the Energy and Water in a Warming World initiative—is the first systematic assessment of both the effects of power plant cooling on water resources across the United States and the quality of information available to help public- and private-sector decision makers make water-smart energy choices. 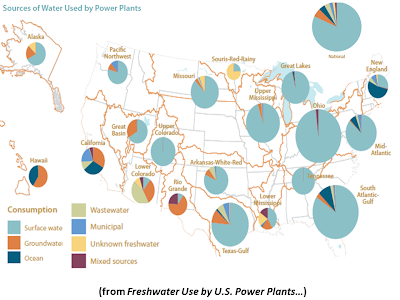 Our analysis starts by profiling the water use characteristics of virtually every electricity generator in the United States. Then, applying new analytical approaches, we conservatively estimate the water use of those generators in 2008, looking across the range of fuels, power plant technologies, and cooling systems. We then use those results to assess the stress that power plant water use placed on water systems across the country. We also compare our results with those reported by power plant operators to the U.S. Energy Information Administration (EIA) for 2008. We examine both the withdrawal and consumption of freshwater. Withdrawal is the total amount of water a power plant takes in from a source such as a river, lake, or aquifer, some of which is returned. Consumption is the amount lost to evaporation during the cooling process. Withdrawal is important for several reasons. Water intake systems can trap fish and other aquatic wildlife. Water withdrawn for cooling but not consumed returns to the environment at a higher temperature, potentially harming fish and other wildlife. And when power plants tap groundwater for cooling, they can deplete aquifers critical for meeting many different needs. Consumption is important because it too reduces the amount of water available for other uses, including sustaining ecosystems. 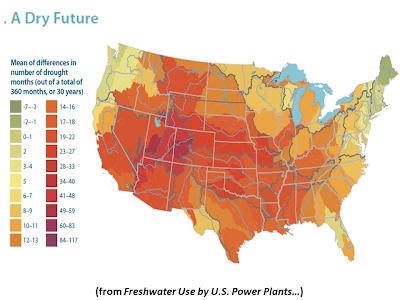 While our analysis focuses on the effects of water use by power plants today, we also consider how conditions are likely to change in the future. In the short run, our choices for what kind of power plants we build can contribute to freshwater-supply stress (by consigning an imbalanced share of the available water to power plant use) and can affect water quality (by increasing water temperatures to levels that harm local ecosystems, for example). Over a longer time frame, those choices can fuel climate change, which in turn may also affect water quantity (through drought and other extreme weather events) and quality (by raising the temperature of lakes, streams, and rivers). Population growth and rising demand for water also promise to worsen water stress in many regions of the country already under stress from power plant use and other uses. • Power plants are thirsty. 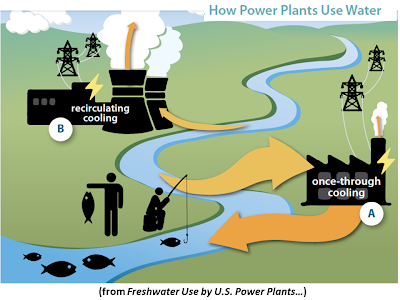 Every day in 2008, on average, water-cooled thermoelectric power plants in the United States withdrew 60 billion to 170 billion gallons (180,000 to 530,000 acre-feet) of freshwater from rivers, lakes, streams, and aquifers, and consumed 2.8 billion to 5.9 billion gallons (8,600 to 18,100 acre-feet) of that water. Our nation’s large coal fleet alone was responsible for 67 percent of those withdrawals, and 65 percent of that consumption. • Where that water comes from is important. In the Southwest, where surface water is relatively scarce, power plants withdrew an average of 125 million to 190 million gallons (380 to 590 acre-feet) of groundwater daily, tapping many aquifers already suffering from overdraft. By contrast, power plants east of the Mississippi relied overwhelmingly on surface water. • East is not west: water intensity varies regionally. Power plant owners can reduce their water intensity—the amount of water plants use per unit of electricity generated. Plants in the East generally withdrew more water for each unit of electricity produced than plants in the West, because most have not been fitted with recirculating, dry cooling, or hybrid cooling technologies. Freshwater withdrawal intensity was 41 to 55 times greater in Virginia, North Carolina, Michigan, and Missouri than in Utah, Nevada, and California. 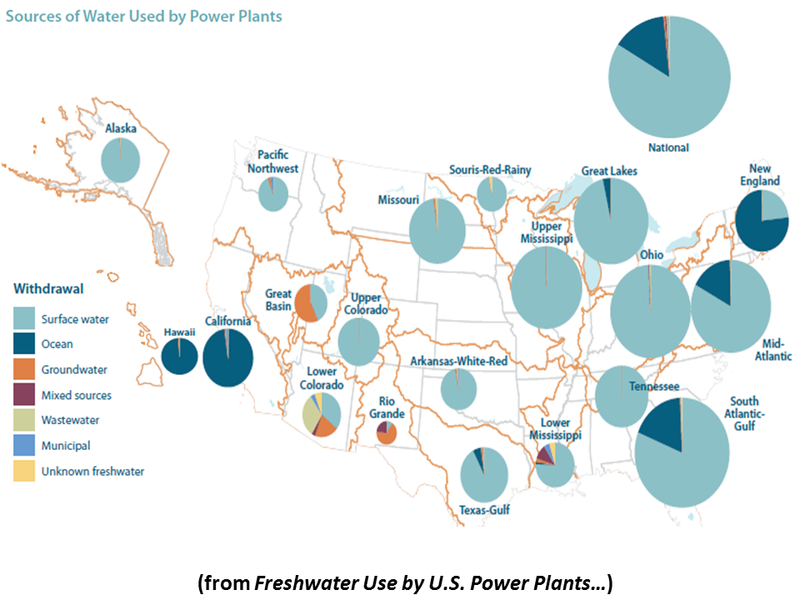 Freshwater consumption intensity was similar in those sets of states. 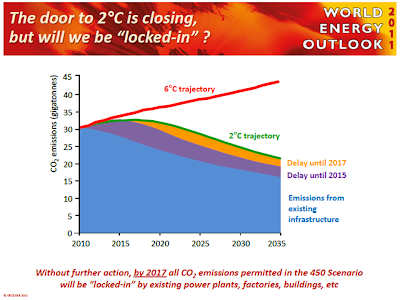 • Low-carbon electricity technologies are not necessarily low-water. 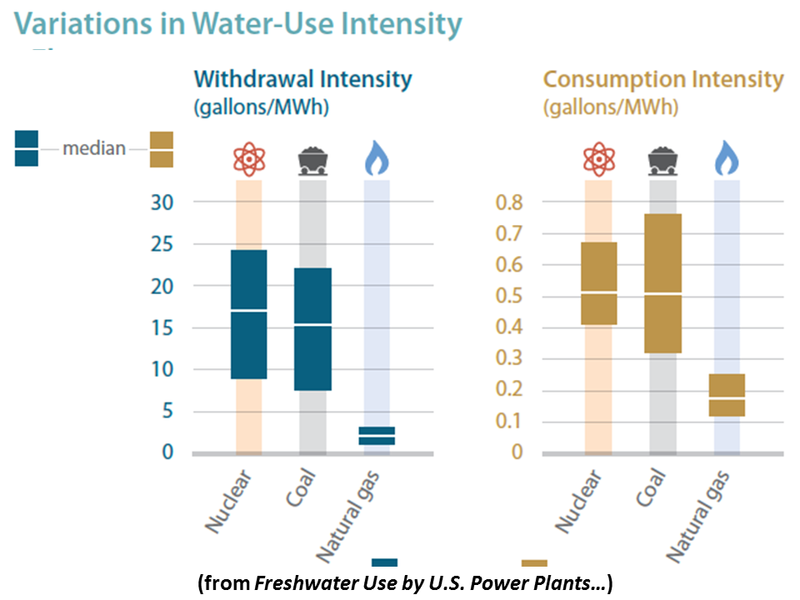 On average in 2008, plants in the U.S. nuclear fleet withdrew nearly eight times more freshwater than natural gas plants per unit of electricity generated, and 11 percent more than coal plants. 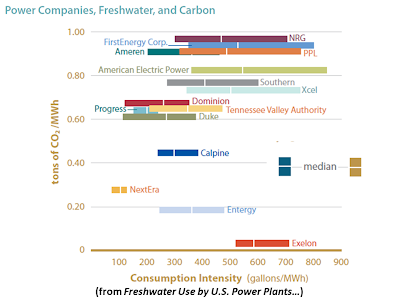 The water intensity of renewable energy technologies varies. Some concentrating solar power plants consume more water per unit of electricity than the average coal plant, while wind farms use essentially no water. • Power plants across the country contribute to water-supply stress. Based on our analysis, in 2008, 400 out of 2,106 watersheds across the country were experiencing water-supply stress. Power plants, by tapping this overstretched resource for cooling purposes, contributed to water-supply stress in one-fifth of those. 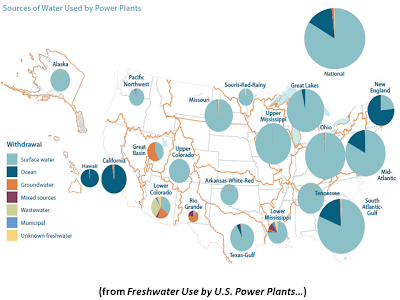 We focused on 25 watersheds in 17 states in which power plants were the primary driver of water supply stress based on our analysis. Several states including North Carolina, South Carolina, Missouri, and Michigan had more than one of those watersheds, including the Catawba and Seneca Rivers. • High-temperature water discharges are common. Peak summer temperatures for return flows from more than 350 power plants across the country exceeded 90°F. Some 14 states prohibit such discharges, which can harm fish and other wildlife. 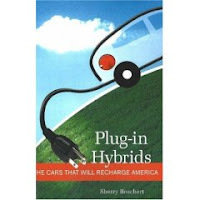 • The mix of power plants in the nation’s fleet matters. 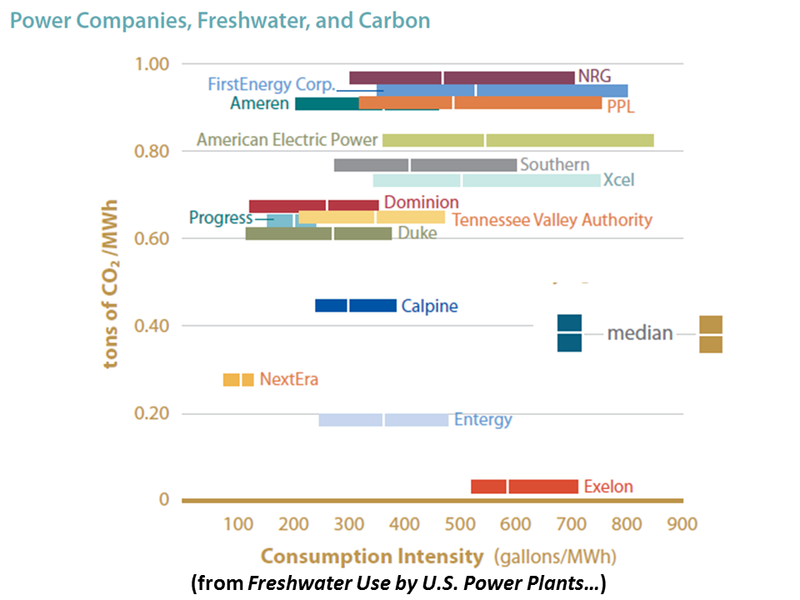 The power plant portfolios of U.S. companies have widely varying water-use and carbon emissions profiles. 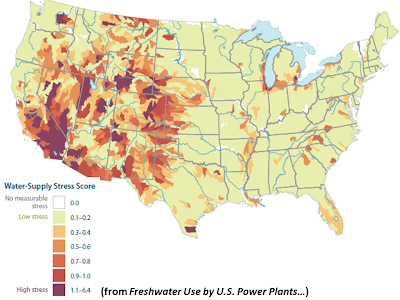 Utilities with lower-water plants place less stress on local water sources. 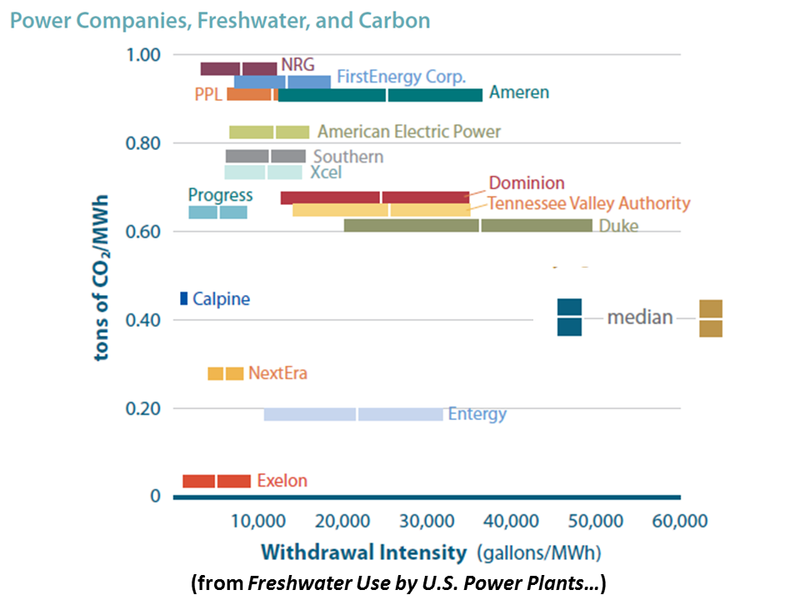 Utilities with carbon-intensive power plants contribute to long term water stress by exacerbating climate change. • Gaps add up. 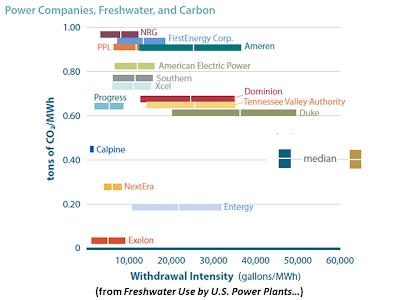 Power plants that did not report their water use to the EIA accounted for 28 to 30 percent of freshwater withdrawals by the electricity sector, and at least 24 to 31 percent of freshwater consumption by the sector, according to our calculations. Gaps in the 2008 information included all water use by nuclear power plants. • Discrepancies are widespread. 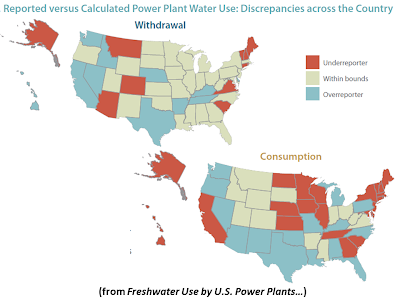 Reported freshwater use by power plants across the country fell outside the bounds suggested by our analysis, including plants in 22 states for withdrawal, and 38 states for consumption. 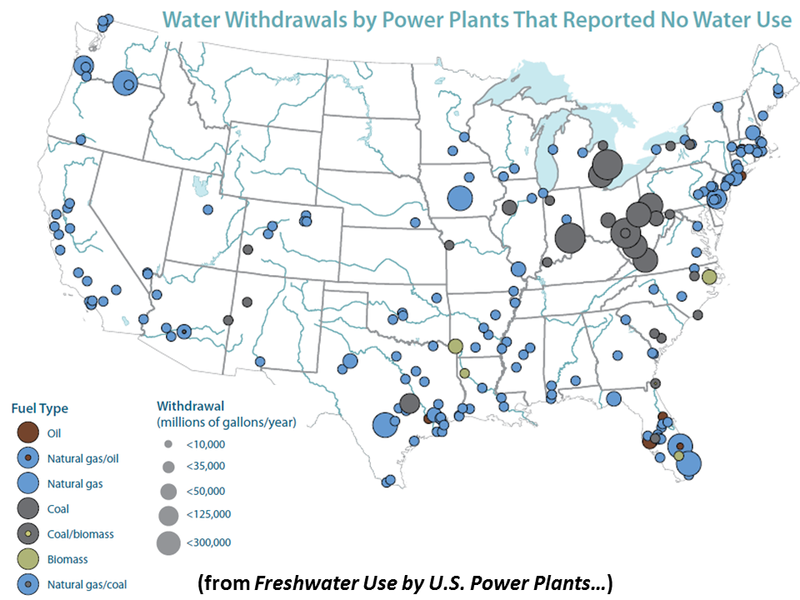 The discrepancies were especially large in the Lower Colorado River and Southeast-Gulf regions, where plant operators reported consumption five times greater—and withdrawals 30 percent less—than median water use values would suggest. • Discrepancies stemmed from a range of causes. 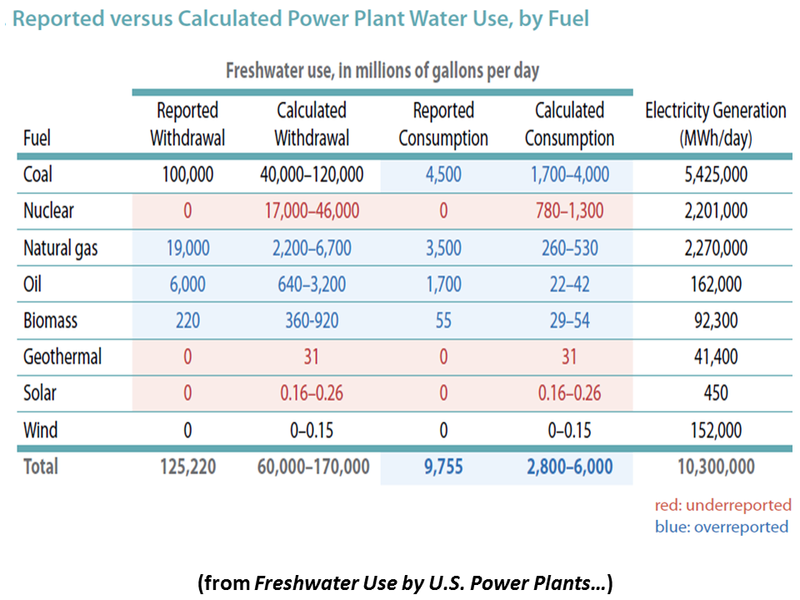 Some power plant operators are exempt from reporting their water use based on plant size or technology. Many operators appeared to report peak rates of water use rather than the requested annual average rate, leading to overestimates. Other operators reported zero water use. • Good analysis requires good information. Using the available data masks existing water stress. Several of the 25 watersheds identified did not show up when we analyzed EIA-compiled information. Averting energy-water collisions requires that power plant operators regularly report accurate information on their water use to the EIA and state agencies. The EIA has been working to improve such reporting, to better meet the needs of public- and private-sector decision makers. The agency may therefore remedy many of the problems we identified with the 2008 data shortly. However, providing better information is only the first critical step. Decision makers must then put that information—coupled with sound analyses of water stress—to work in curbing electricity’s thirst, especially in water-stressed regions. 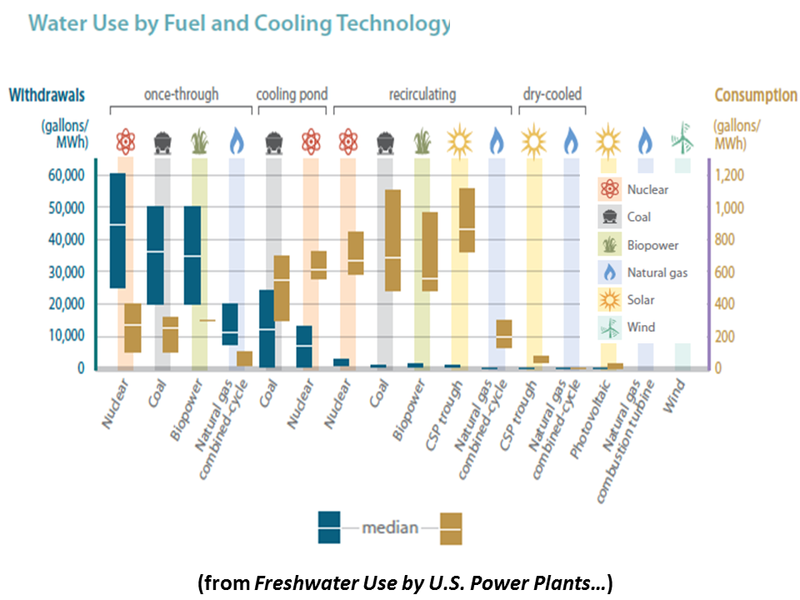 Our analysis provides a strong initial basis for making water-smart energy choices. • Get it right the first time. Developing new resources for meeting electricity demand provides a critical opportunity for reducing water risks for both power plant operators and other users. 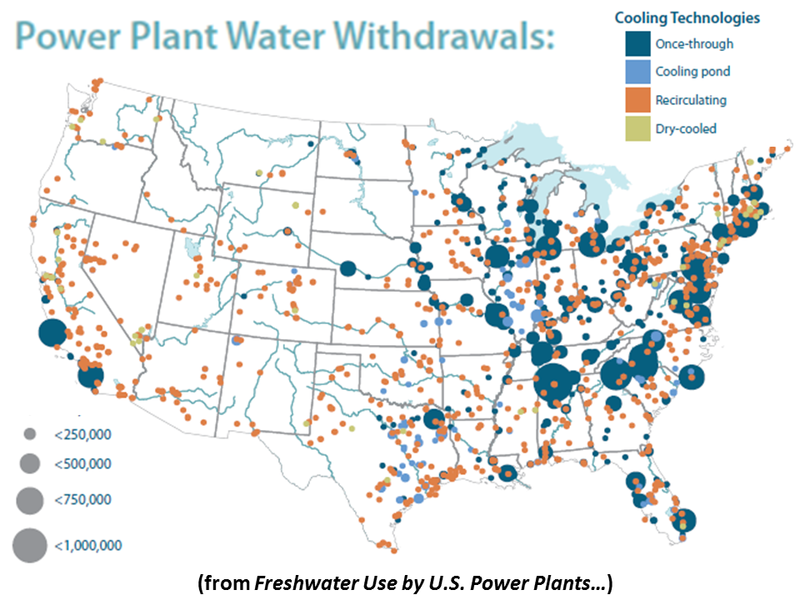 Utilities and other power plant developers would be well advised to prioritize low-water or no-water cooling options, particularly in regions of current and projected high water stress. Some developers are already making such choices. For example, the project developer’s choice of dry cooling for the 370-megawatt Ivanpah concentrating solar power (CSP) project under construction in California’s Mojave Desert means that the facility will consume 90 percent less water per unit of electricity than typical wet-cooled CSP plants. Other developers and utilities are reducing the risk of energy-water collisions by choosing technologies that use essentially no water, such as wind and solar photovoltaics, and by investing in energy efficiency. • Retool existing plants. Owners and operators of existing power plants with substantial effects on the supply or quality of water in water-stressed regions could consider retrofitting to low-water cooling. When the 1,250-megawatt Plant Yates near Newnan, GA, added cooling towers in 2007, it cut water withdrawals by 93 percent. 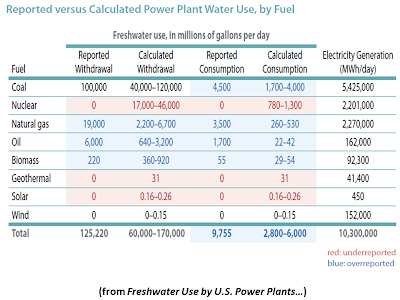 Even greater reductions in freshwater use are sometimes essential. In much of the Southwest, even low water withdrawals can spell trouble, particularly when they come from diminishing aquifers. Water consumption, too, can pose problems. Power producers in highly water-constrained settings can make water-smart choices—as Xcel Energy, which operates the 1,080-megawatt Harrington Station in Amarillo, TX, did in 2006, when it switched to treated wastewater to meet the plant’s cooling needs. • Set strong guidelines for power plant water use. Public officials can draw on good information on electricity’s thirst to help owners of existing and proposed power plants avert energy-water collisions. Public utility commissions, which oversee the plans of utilities and specific plant proposals, can encourage or require investments that curb adverse effects on water supply or quality, particularly in areas of current or projected water stress. Legislators also have a stake in averting energy-water collisions. The Colorado legislature’s 2010 decision to retire more than 900 megawatts of coal plants in favor of natural gas, energy efficiency, and renewable energy will reduce water consumption by a volume roughly equivalent to that used by 50,000 people. • Engage diverse stakeholders. Mayors securing water supplies for their cities, anglers concerned with sport and commercial fishing, water resource managers at all levels, and others all have a stake in averting energy-water collisions. 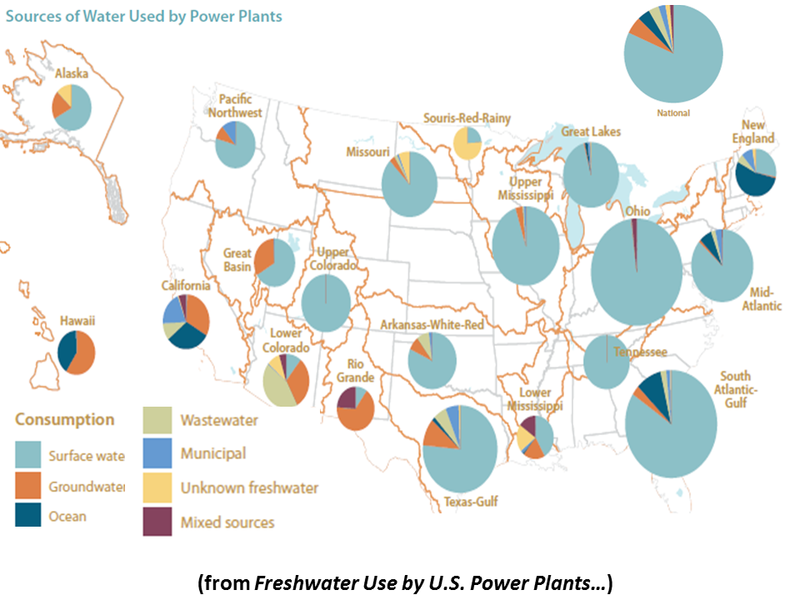 Full public access to information on water use by existing and proposed power plants will enable these and other local stakeholders to become informed about the benefits of water-smart energy choices. • Reduce power plant carbon emissions. Because human-caused climate change is worsening water stress across much of the United States, water-smart energy choices should include investing in resources that are also low-carbon. The new cooling towers for the coal-burning Plant Yates reduce its impact on water stress but not its carbon emissions. The coal-burning generators at Harrington Station in Amarillo, although relying on treated wastewater, still emit prodigious quantities of carbon. Of course, not all low-carbon options are water-smart. Some, such as wind power and energy efficiency, are inherently low-water. Others, such as the proposed carbon capture and storage for coal plants, are not, and could worsen energy-water collisions if used in regions with water stress. Averting energy-water collisions means taking a long view. Power plants are designed to last for decades, and much of our existing infrastructure will continue operating for years. Our nation’s precious freshwater resources will face ever more stress from growing populations, a changing climate, and other trends over the next several decades. The typically high cost of retrofitting power plants means that decisions on the water impact of today’s plants should consider the risks they pose to freshwater resources and energy reliability throughout their expected lifetime. The next report from the Energy and Water in a Warming World initiative will take up this challenge by exploring how energy choices affect the resilience of our energy sector in the face of both periodic drought and long-term changes in water availability. Zooming in on key regions of the country will yield a more robust understanding of how the energy technologies we choose to power tomorrow’s world would affect water resources. Decisions made today about which power plants to build, which to retire, and which energy or cooling technologies to deploy and develop matter greatly. 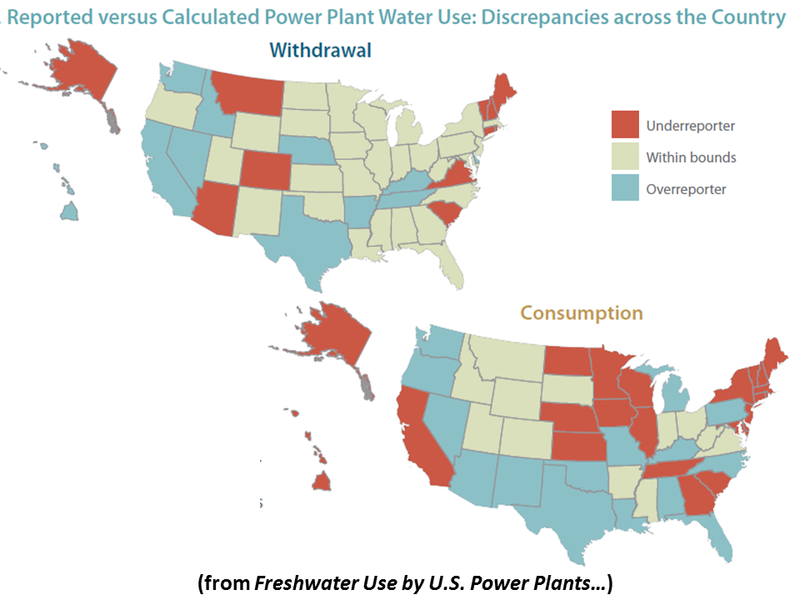 Understanding how these choices affect water use and water stress will help ensure that the dependence of power plants on water does not compromise that resource, the plants themselves, or the energy we rely on them to provide. "Reportedly…[ agreement] broke down along party lines - Democrats aiming to initiate tax increases and Republicans balking at the idea. 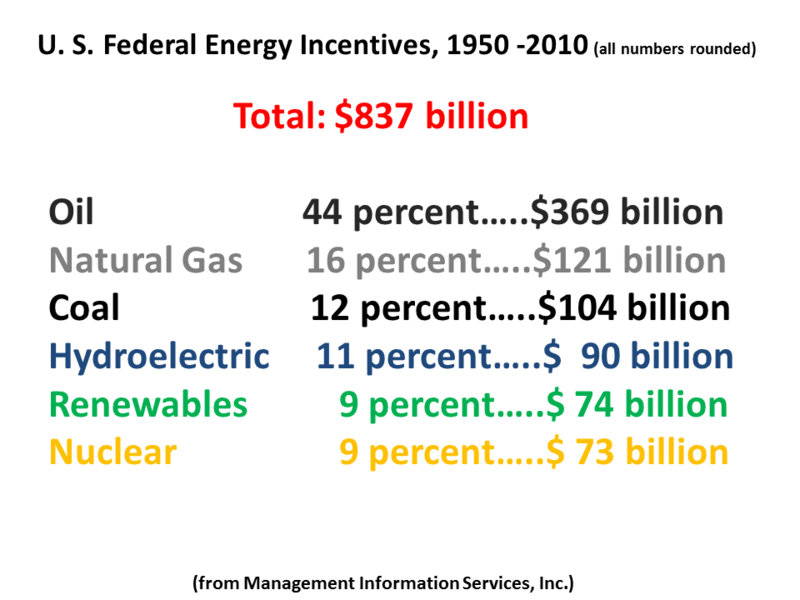 This also meant that the future of key incentives important for renewables, such as extensions of the Sec. 1603 cash-grant program, (which expires at the end of this year) and the production tax credit (which, for wind, expires at the end of 2012, and 2016 for solar), is still murky…"
"…Christi Tezak, senior energy and environmental policy analyst at Robert W. Baird & Co…[is less optimistic]…[She noted that extending the cash-grant] program adds to the deficit…[O]ther than the payroll tax extension, which the White House has indicated it would like to see extended even if it is not offset, all other program extensions appear to need to be paid for…[Tezak said she] would be very surprised if any expiring program other than the payroll tax gets extended this year…"
"Pike Research’s analysis indicates that the consumer market for energy harvesting will represent approximately 42% of all unit shipments by 2015. Key applications in this sector include mobile phones, laptop computers, remote controls, portable lighting, and the continuing market for wristwatches powered by kinetic energy…"
"…[I]ndustrial applications will represent the majority of the energy harvesting market, with a compound annual growth rate in excess of 100% for the sector as a whole. Key emerging industrial markets during that period will include wireless sensor networks (which will represent a large majority of the industrial sector), military devices, medical devices, and automotive devices. "The principal technologies used for the transduction of ambient energy into usable electrical energy include photovoltaic (PV), thermoelectric, piezoelectric, and electromagnetic. Pike Research forecasts that, between now and 2015, PV energy harvesting technologies will be most prominent in the market, capturing approximately 40% of total revenue share by the end of that period. 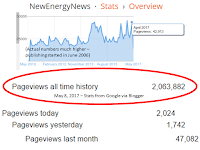 Electromagnetic and piezoelectric technologies will each garner about one-quarter of the total market, with thermoelectric energy harvesting representing approximately 12%..."
"NRG Energy, Inc. (NYSE: NRG) has acquired…Solar Power Partners, a leading developer of commercial and industrial (C&I) distributed solar projects. 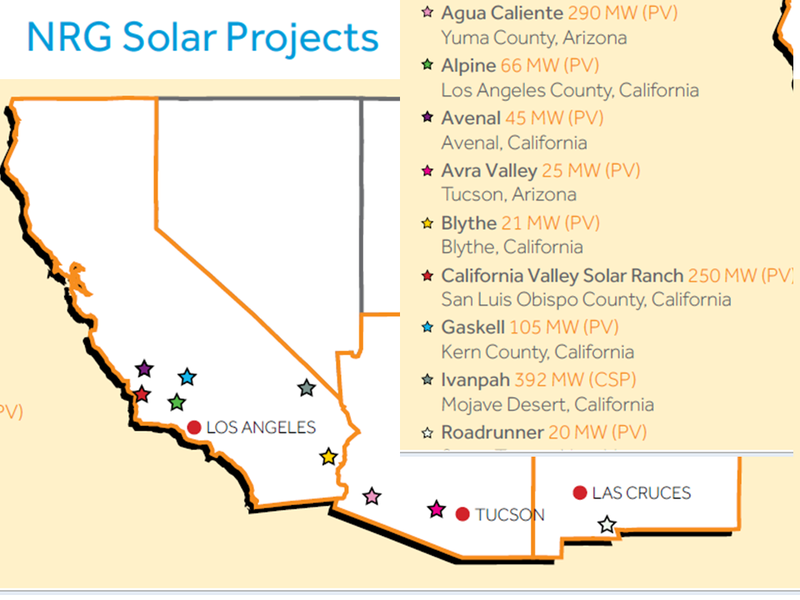 "In addition to 30 megawatts (MW) of distributed solar projects in operation or under construction, NRG also will secure development rights to Solar Power Partners’ extensive pipeline of development projects in California, Hawaii, Arizona, Connecticut, New Mexico, Massachusetts, New Jersey, Ontario and Puerto Rico. SPP sites include grocery stores, hospitals, universities, office buildings, municipal buildings, schools and airports…"
"NRG is…[a] Fortune 500 company…[and] one of the largest solar power developers in the country…NRG Solar LLC, a subsidiary of NRG, has more than 2,000 MW of photovoltaic and solar thermal projects under development or in construction across the southwestern United States…"
Activists want this piece by Robert F. Kennedy, Jr. (President of Waterkeeper Alliance, Senior Attorney for the Natural Resources Defense Council, a Partner in VantagePoint Capital Partners) to be spread far and wide. It’s now become de rigueur among the radical right wing rhetoricians to characterize any government support of America’s green energy sector as wasteful, fruitless, and scandalous. They greeted with glee the collapse of the government supported solar company, Solyndra, America’s first major casualty in our race with China to dominate the “new energy” economy. With Solyndra dying on the battlefield—its marketplace choking on inexpensive Chinese solar panels—the right wing’s response was to hoist the white flag and declare defeat in the war for global cleantech leadership. That brand of “Can’t Do” cowardice is a boon to the carbon and nuclear power incumbents who fund so much of the right wing’s activities—but it’s bad for America. Leveraging the aberrant Solyndra bankruptcy, these groups have launched an orchestrated series of attacks against the renewables sector by trying to discredit other companies, even those that are driving America forward with innovative solutions that actually do compete on a global basis. 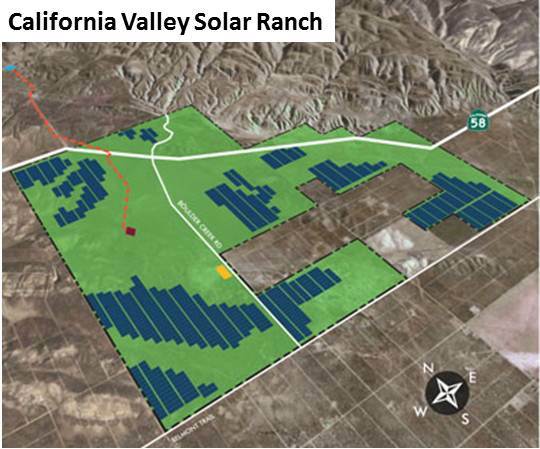 For example, last month, Fox News ran a story insinuating that SunPower received a loan guarantee for its Central Valley Solar Ranch project because of its political connections Congressman George Miller. The story also suggested that SunPower was struggling financially and posed another risk to taxpayers—a la Solyndra. The truth is that SunPower is one of America’s strongest solar manufacturing companies and Mr. Miller had nothing to do with the company receiving a loan guarantee for its Central Valley Solar Ranch Project. To Fox News and other right wing media sources, the facts meant very little. Their intent is only to suggest wrong-doing in an attempt to undermine the Obama Administration and its clean energy goals. Last week found the right wing echo chamber, from Fox News to the New York Post, and the conservative blogosphere in an anti-green frenzy based on faux facts from a new book, Throw Them All Out. The author of this far-fetched screed is Peter Schweizer, Sarah Palin’s foreign policy guru, currently employed by the Hoover Institution, a think tank funded largely by oil interests (e.g., Exxon, ARCO, Transamerica, and Richard Mellon Scaife’s oil and banking fortune) to craft the philosophical underpinnings for unregulated pollution, unrestricted corporate profit taking, and massive corporate welfare for the carbon/nuke incumbents. All of the reported “facts” in this blogosphonic barrage were Schweizer’s inventions. Schweizer claims that BrightSource Energy received a government bailout due to political influence exerted on behalf of VantagePoint Capital Partners, where I am a partner and which is the largest institutional shareholder of BrightSource. The actual facts do not support Schweizer’s claims. 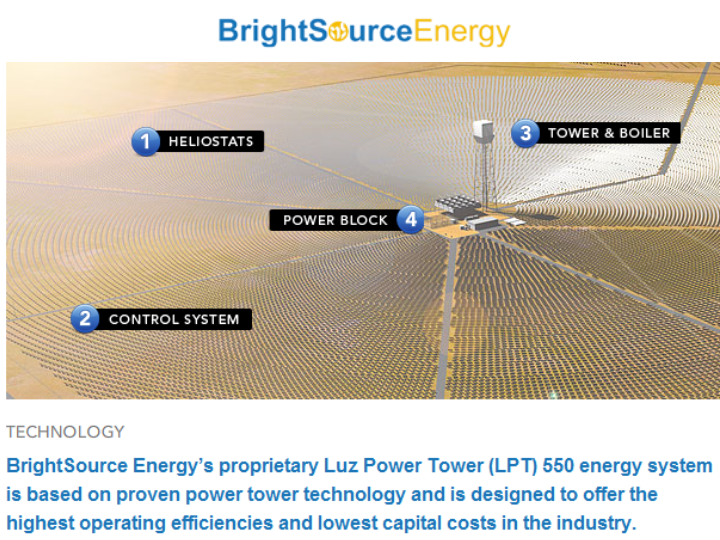 BrightSource Energy did not receive a bailout. Rather, the Ivanpah project, a 392 megawatt solar thermal project in the Mojave Desert that will provide clean power to 140,000 homes, received a loan guarantee from the Department of Energy (DOE). Ivanpah, which broke ground in October 2010, is majority owned by Google and energy giant NRG. 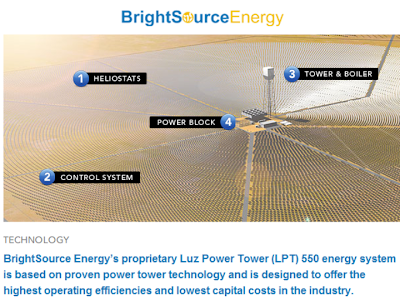 BrightSource is a minority owner of and the technology supplier to the Ivanpah project. The underlying loan from private investors is fully secured, and pays interest that will earn a healthy return for U.S. taxpayers. Unlike Solyndra which received corporate financing from DOE, and which had no assurance that it would be able to sell its product, Ivanpah and the Central Valley Solar Ranch projects have contractual commitments from California’s largest utilities to buy all of its power at fixed prices. This is comparable to building a new hotel with the guarantee that it will have 100% occupancy rates for 20+ years. Schweizer’s claims that the loan guarantee works out to a cost to taxpayers of $1 million per job is also a canard. The Ivanpah project is one of the largest infrastructure projects in the nation and the largest solar thermal plant under construction in the world. The project’s three year construction phase will create 1,400 highly-skilled trade, engineering and construction jobs at peak. These are high paying union jobs in a region plagued by one of America’s highest unemployment rates. The project will generate $250 million in earnings for these construction workers and, over its 30 year life, will produce $650 million in earnings for workers on the site, including the 90 permanent jobs required to operate the plant. Finally, the $2.2 billion Ivanpah project is an investment in America’s future with substantial indirect economic benefits locally and across the nation. The majority of the project’s supply chain is being sourced domestically across 17 states, driving investments throughout the country and creating additional jobs in other areas of the United States that have been adversely affected by the economic downturn. The Ivanpah project is also generating $300 million in state and local tax revenues over its life. 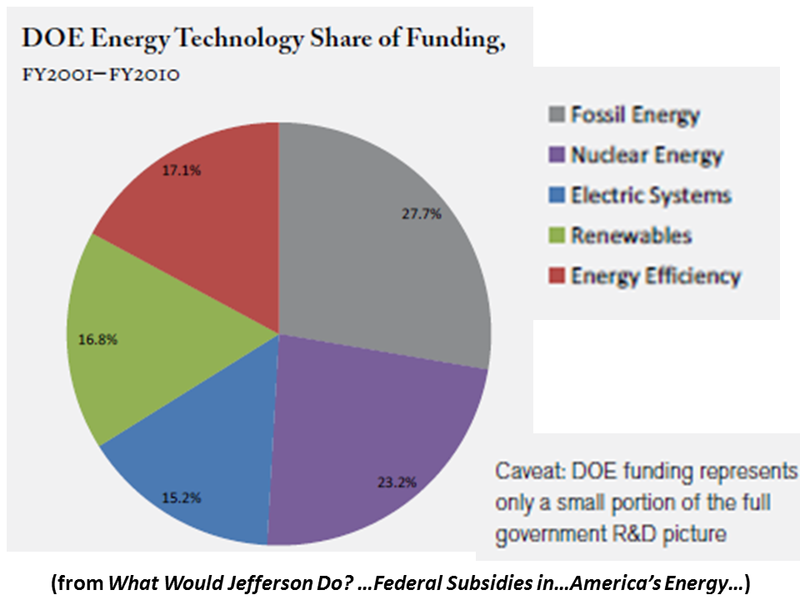 The right wing’s campaign against the DOE’s support of renewable energy is not in our national interest. The DOE loan guarantee program has been extremely successful in providing debt financing to innovative energy projects in the wake of the 2008 credit market challenges. Access to capital is a crucial component of building innovative energy infrastructure and creating economic benefit. The DOE loan guarantee program has also been very successful at attracting private capital to these projects. Each dollar appropriated for the program leverages $13 dollars in private sector investment. As of August 2011, DOE had made commitments to 37 clean energy projects, leveraging private investment of more than $40 billion. 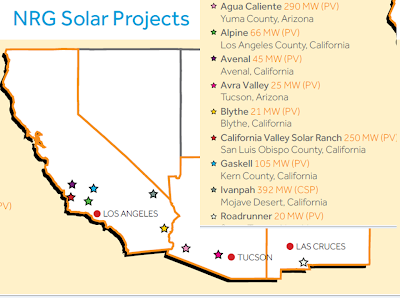 This includes more than 10 utility-scale solar power projects in the Southwest, including SunPower’s Central Valley Solar Ranch and BrightSource’s Ivanpah. These projects are estimated to create tens of thousands of jobs across the country. 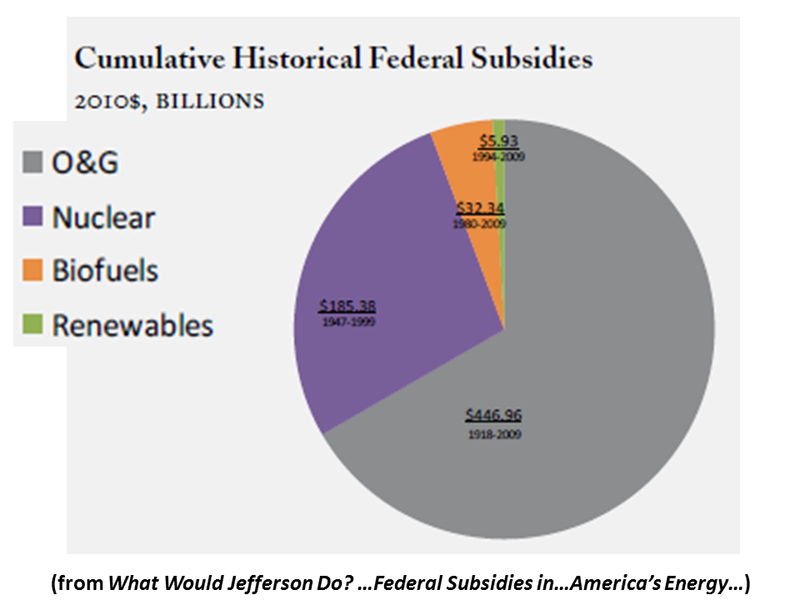 Where is the Right Wing Opposition to the Obscene Subsidies to Carbon and Nuke? 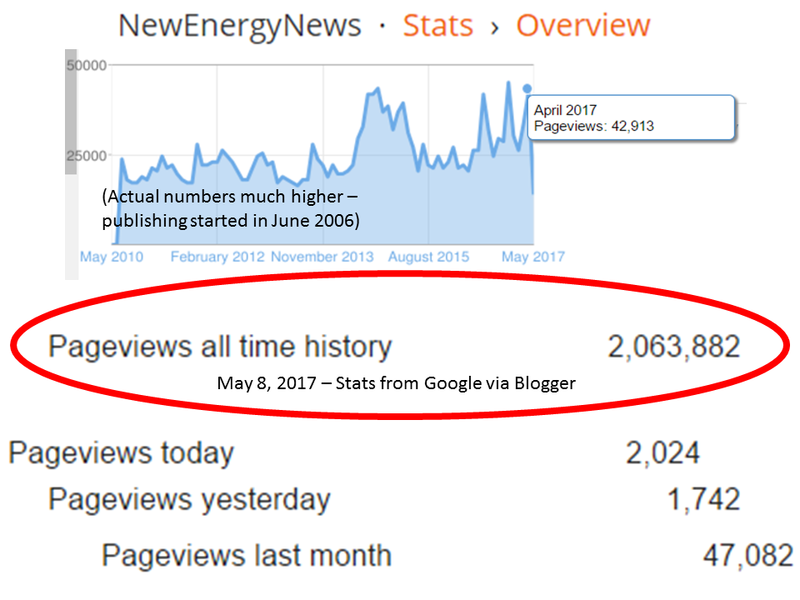 The frenzy against government support for green energy is ironic considering the silence from those same quarters regarding the hundreds of billions of dollars in annual subsidies and externalized costs flowing from government and the American public to the carbon and nuke companies that fund the right wing think tanks and the conservative blogosphere. The same DOE loan guarantee program that supported the solar projects gave an astonishing $8.3 billion loan guarantee—many times the size of the solar projects—to Southern Company to build two nuclear power plants. 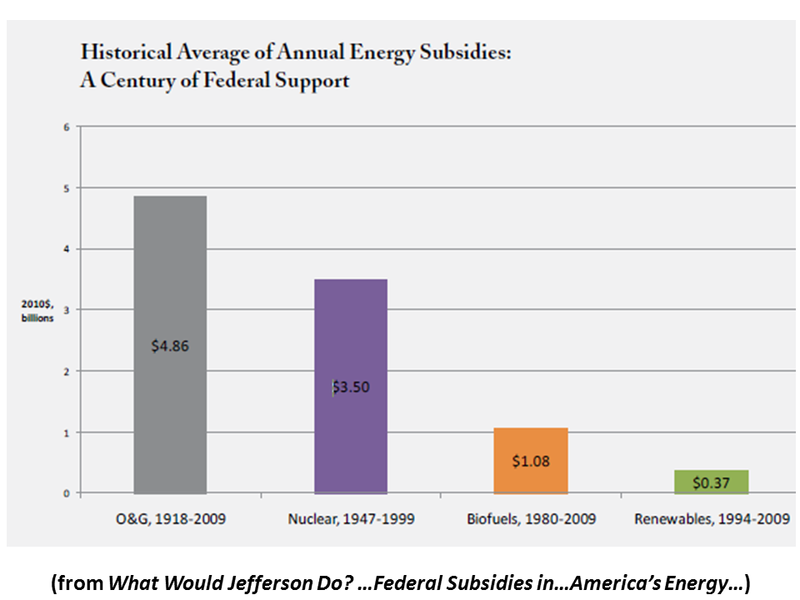 Nuclear power is an industry with a product so expensive it cannot compete in any version of free market capitalism. 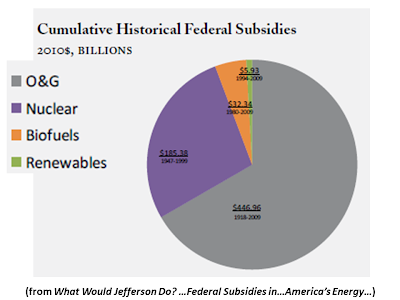 Big nuke is totally dependent on massive, monstrous public and government subsidies at every stage of its life. Oil is a close second. 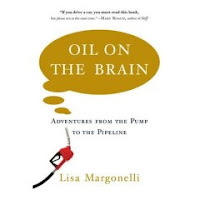 A comprehensive inventory of oil subsidies by former California EPA Chief Terry Tamminen, in his acclaimed book Lives Per Gallon, calculates U.S. subsidies to the oil industry at upward of one trillion dollars annually! This blogosphere wrangling is part of a larger struggle pitting disruptive technologies like LED lights, electric cars, and renewable energy such as wind and solar—the clean, green democratic, abundant, and patriotic fuels from heaven—against the powerful incumbents of coal, oil, and nuke—the destructive, plutocratic, largely foreign owned, addictive, poisonous, destructive, and war breeding fuels from hell. Crane points out that his vendors are already offering solar panels at slightly less than $1.00 per watt, leading to an all-in cost of installed solar on a distributed basis of $2.50/watt. This, according to Crane, translates into 12¢/kilowatt hour, making home grown solar energy cheaper than the grid in 20 states. Experience shows that these industries are demonstrated jobs producers. There are already more Americans employed by the solar industry (110,000) than there are coal miners (90,000), and the wind industry (75,000) is rapidly expanding its workforce. 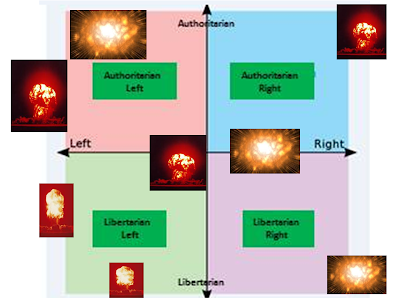 The only questions now are: How fast will the transition occur? Which nations will lead the way and reap the financial rewards of that leadership? Unfortunately, due to the outsized influence of big coal, oil, and nuke on our Congress, America is lagging. China’s bold strategy is to dominate the new energy economy with giant investments in wind, solar, LED light bulbs, smart grid systems, and electric cars. Despite our strong lead among entrepreneurs, the American government’s willingness to compete with the Chinese in these domains has been anemic. The Waxman-Markey bill, which passed the House and then died under pressure from the carbon cronies in the Senate, would have increased solar deployment in America by a mere 37% by 2020. The Chinese have already committed to increase their solar development by 20,000% during that period and wind development by 1200%. While the right wing whines about a $1.6 billion loan guarantee to a solar project, the Chinese are funneling $758 billion to their solar and wind industry over 5 years. I commend the Chinese for their commitment to transition to a green energy economy. But I refuse to accept the right wing narrative that America can no longer compete in the world marketplace. Americans still lead the world in patents filed and the other indicia of entrepreneurship. The promising new technologies and young green tech companies that I see daily are challenged principally by a lack of capital available from our banks and government. This is more than an issue of national wealth and prosperity—our national security is also at stake. The war by America’s carbon and nuclear energy industries and their right wing allies, against our country’s burgeoning cleantech industry is damaging our economy and subverting our national security, just as it has in the past led us into oil wars. When I was a boy, America owned half the wealth on Earth. We lost that advantage mainly due to our carbon addiction, which still causes us to hemorrhage nearly $750 billion annually in American wealth—the cost of importing foreign oil. The Chinese would naturally like us to spend what’s left of our national wealth purchasing Chinese solar panels, Chinese LED lights, and Chinese wind turbines and electric cars. Democrats and Republicans in Congress, many in the thrall of Big Carbon, are sitting on their hands as the hemorrhage continues. The incumbents are able to control the political process in Washington with the support of their right wing media flacks, and with hundreds of millions in annual contributions and lobbying. Such investments allow the incumbents to reap hundreds of billions in annual subsidies from U.S. taxpayers, artificially ballooning their profits. These are self-destructive policies for America. With the same resolve that established America’s industrial and technological greatness in the 20th century, leading the transition to a new energy economy is America’s best hope for true national security, prosperity, and restoring our global leadership and moral authority. "Mainstream said it decided to put the deal on hold following the conviction of an AMSC employee in Austria for supplying AMSC grid codes to Sinovel. 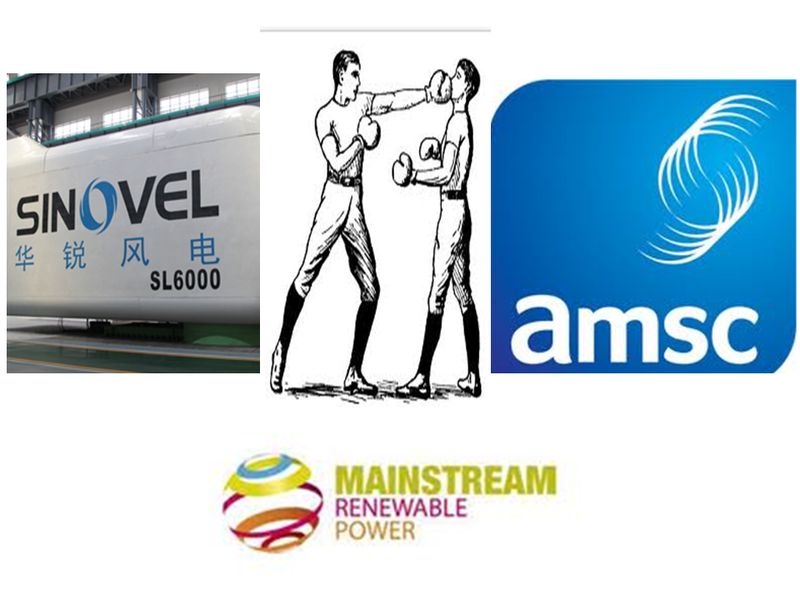 AMSC and Sinovel are going head-to-head in the Beijing High Court over the row." currently looking at alternative suppliers. It hopes to install 50MW in Ireland in 2012." "Renewable energy is surpassing fossil fuels for the first time in new power-plant investments, shaking off setbacks from the financial crisis and an impasse at the United Nations global warming talks. "Electricity from the wind, sun, waves and biomass drew $187 billion US last year compared with $157 billion US for natural gas, oil and coal, according to calculations by Bloomberg New Energy Finance…Accelerating installations of solar and wind power led to lower equipment prices, making clean energy more competitive with coal…The findings indicate the world is shifting toward consuming more renewable energy even without a global agreement on limiting greenhouse gases. Delegates from more than 190 nations converge in Durban, South Africa, on Nov. 28 to discuss new measures for limiting emissions damaging the climate…"
"The renewables boom, spurred by about $66 billion US of subsidies last year, intensified competition between wind- turbine and solar-panel manufacturers, gutting margins from the biggest producers led by Vestas Wind Systems A/S and First Solar Inc. The 95-member WilderHill New Energy Index of renewable- energy stocks has tumbled 40 per cent this year, steeper than the 14 per cent drop in the MSCI World Index. "The zeal to replace fossil fuels…belies the failed efforts at the UN talks to broker a deal that would limit carbon dioxide emissions from coal and oil blamed for global warming. Without a deal, existing pollution caps under the 1997 Kyoto Protocol expire next year…Debate in South Africa…will include how to establish a fund that would channel an unspecified portion of $100 billion US a year in climate aid pledged by rich nations to developing countries by 2020…Monitoring and verifying emissions cuts…[and creating] a mechanism for transferring CO2- reducing technology between states…"
"The Bergey Excel 10 is a 23 ft diameter horizontal-axis turbine designed to provide the annual energy requirements for homes, farms, and small businesses. 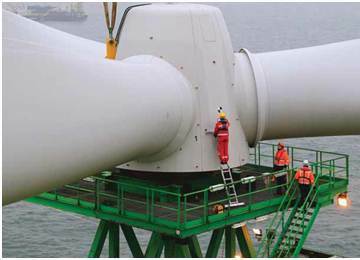 More than 2,000 Excel turbines have been installed in 46 states and more than 50 countries. It has only three moving parts, requires no annual maintenance, and was the first small wind turbine to carry a 10-year warranty…"
"Certification of the Excel 10 turbine was granted by the Small Wind Certification Council (SWCC), an independent organization funded by several states and the U.S. Department of Energy…California, New York, Oregon and Wisconsin, which provide substantial rebates for small wind turbines, now require partial or full certification to the AWEA standard and a number of other states plan to do the same…"
A new Chinese competitor has emerged in the wind manufacturing arena. 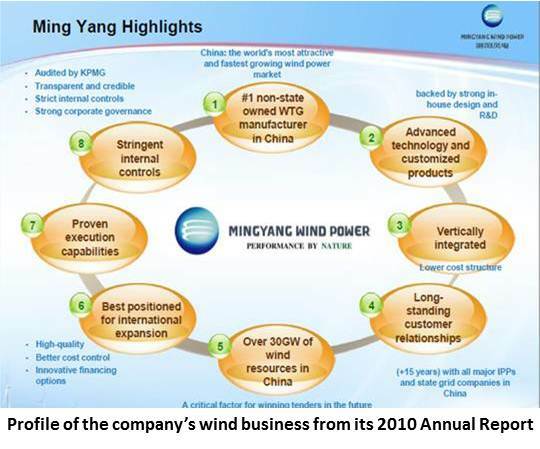 With Guangdong Ming Yang Wind Power Industry Group Co., Ltd.’s development financing and planning cooperation agreement worth up to $5 billion with China Development Bank Corp. (CDB), a government policy bank wholly owned by China's central government, the company steps into the big game. 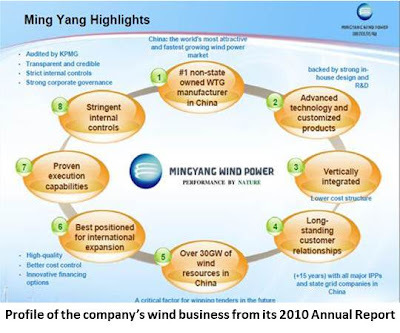 Ming Yang is a subsidiary of China Ming Yang Wind Power Group Limited (NYSE: MY). 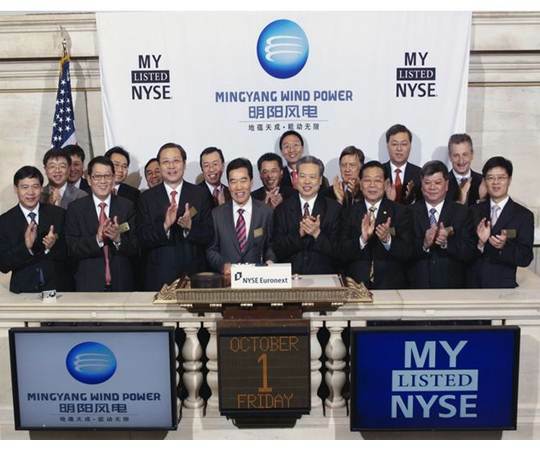 MY is the only Chinese wind company listed on a U.S. exchange. Ming Yang CFO Manfred Loong, who came aboard in early 2010 to help guide the company’s IPO in October of last year, called the agreement “a very important milestone” for his company. As the only major non-state-owned Chinese wind manufacturer, this agreement signals a crucial step forward for Ming Yang. With this backing, it can move with China’s other big wind manufacturers into the international arena, just as the domestic Chinese market, which has supported unprecedented growth over the last two to five years, plateaus. Loong said the agreement was the result of a year-long relationship between Ming Yang and CDB. “Since our listing,” Loong said, “we have continued to grow our domestic market share and ready ourselves for international expansion.” He noted that ICBC and CCB, two major Chinese financial institutions, have invested in the company. Its working capital, he said, is now at approximately 15 billion RMB, or roughly USD $2 billion. Ming Yang’s focus on fundamentals, Loong said, earned the financial support. 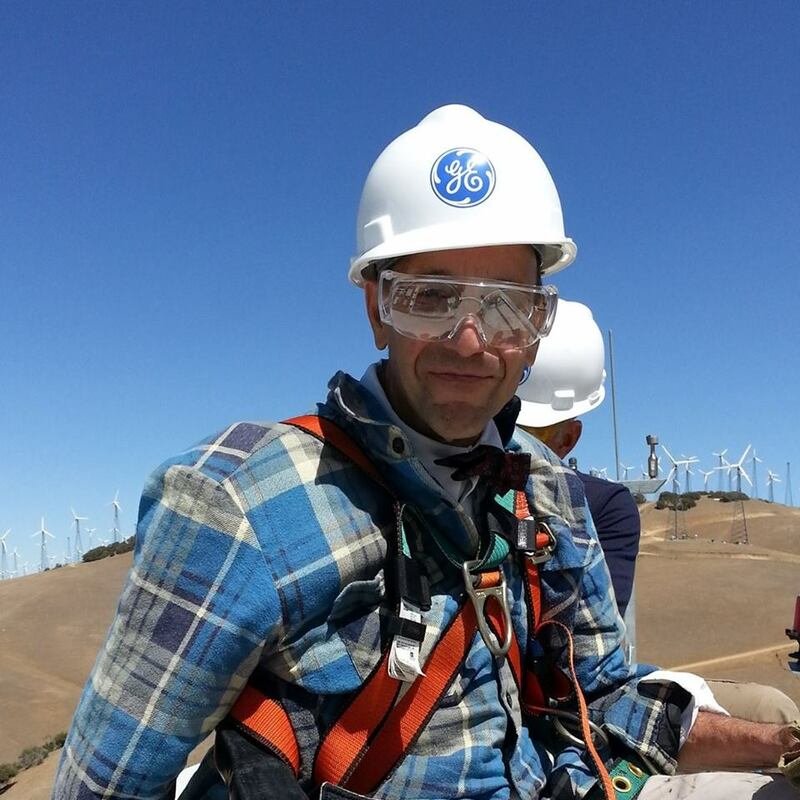 “We have always been a very reputable turbine manufacturer and supplier,” he explained. This latest affirmation of Ming Yang’s reputability is especially noteworthy because some of China’s 80-plus turbine manufacturers are not regarded as highly, a situation the government has recently attempted to rectify by tightening regulations on turbine quality. 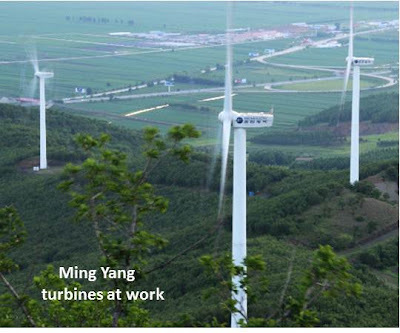 Ming Yang’s association with the other banks and its support from the Chinese federal government, as well as many local governments in the Northern provinces where its turbines have most widely been used, buoyed its reputation, bringing about the CDB agreement. With its new financial backing, Ming Yang is fully equipped to follow Chinese powerhouses such as Sinovel and Goldwind (both of which, like Ming Yang, opened U.S. offices in the last year) into the U.S. and other international markets. Where these companies cannot get backing from local banks unfamiliar with their products, they will prove themselves by financing their own projects. That this is an emerging trend was verified last month when German wind manufacturer Siemens announced it is willing to put up the balance of the money needed to build Cape Wind. 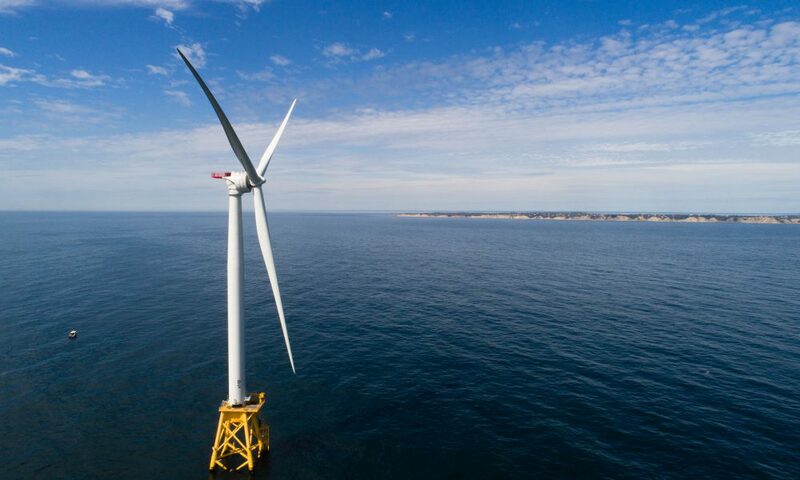 As the first U.S. offshore project, Cape Wind has struggled to get financial backing despite its commitment to use proven Siemens 3.5-megawatt ocean turbines. The trend was demonstrated again last week when GE Financial, parent to leading U.S. wind maker GE Energy, announced both that it will partner with India’s Greenko Group to develop wind projects in India and that it will partially finance an Invenergy 110-megawatt project in Michigan that will use its 1.6-megawatt turbines. Loong was clear that Ming Yang intends to use the new financial backing to expand internationally. “We do have a lot of interest in developing overseas and the U.S. is one of the very critical markets,” he said. The company is also interested, he said, “in Europe, in Asia (including India), in both North and South America, and in Australia.” He said the company expects to have deal announcements before the end of this year. And, in this economy, add financing. 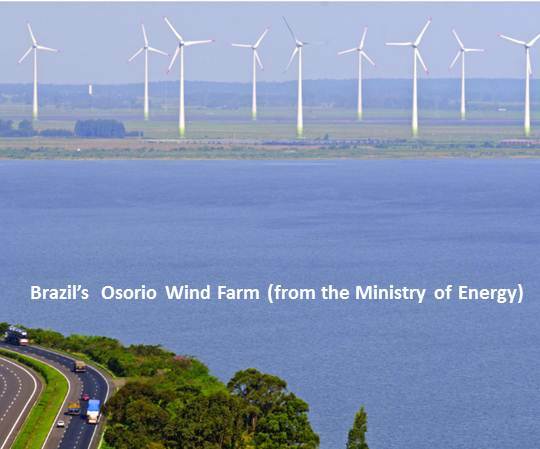 How Did Wind Beat the Price of Natural Gas in Brazil? In one of the world’s major oil and gas producing nations, what is wind doing so right? 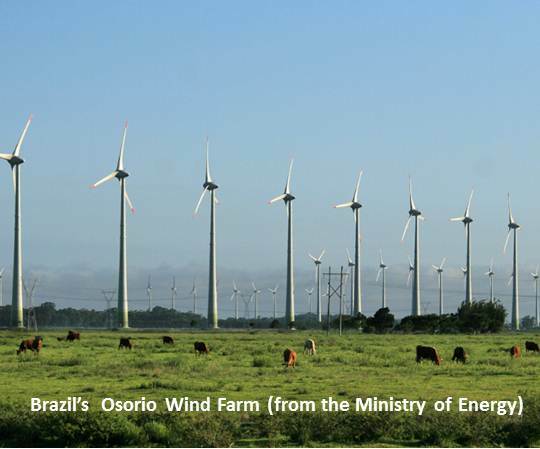 In December 2009, the price of wind in Brazil -- derived in Ministry of Energy-supervised, regulated market auctions -- was 148 Reals ($91.93) per megawatt-hour. 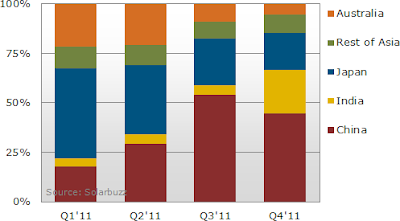 By December of the following year, the competitive price had fallen to 130 Reals ($80.75) per megawatt-hour. At that time, the Ministry revised its 2005 projection from a 2030 installed capacity of 5,000 megawatts to a 2020 installed capacity of 11,000 megawatts. This summer’s National Electric Power Agency (ANEEL) auction saw wind’s price drop to 99.5 Reals ($61.79) per megawatt-hour. The best price for natural gas-generated electricity in the same auction was 103 Reals ($63.98) per megawatt-hour, an economy-turning event for a country that is one of the world’s major oil and gas producers. The most recent auction resulted in contracts for 78 new wind projects in Brazil, representing 1,928 megawatts of new capacity. This came after contracts for some 6,000 megawatts of new wind capacity (nearly six percent of the country’s total electricity demand) were completed as the price fell in 2009 and 2010, according to Hamilton Moss, the Energy Development Director for the Brazilian Ministry of Mines and Energy and Brazil’s renewable energy czar. It is clear from the results of the recent auction, Moss said, that the Ministry will soon again need to revise its projections for wind upward. Present estimates put Brazil’s capacity potential at some 143,000 megawatts, but, Moss said, it could be twice that. A 60% domestic content requirement has helped spur supply chain growth. 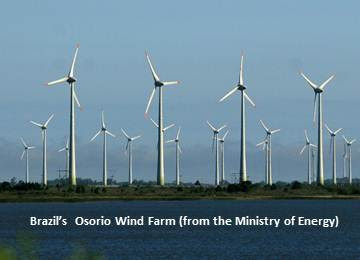 German turbine maker Enercon’s subsidiary Wobben Windpower and Agentinian turbine maker IMPSA were in Brazil early on. They were followed by multinationals like GE, Siemens and Alstom. Danish world-leading turbine maker Vestas and Spanish giant Gamesa are among the most recent entrants. Most international turbine builders, including a number of Chinese companies, are expected to turn up soon. 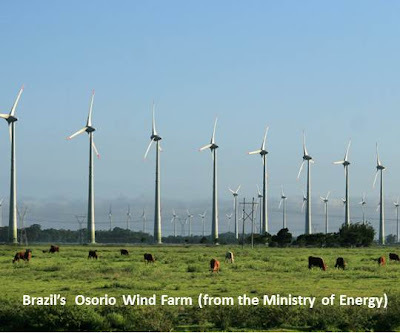 Brazil’s wind, Moss said, has prospered because 1) the resource is rich, 2) a previous incentive system drove enough early growth for planners and builders to gain invaluable experience, 3) the Ministry of Energy carefully sustains legal and regulatory stability and predictability, and 4) the auctions result in 15- to 20-year power purchase agreement-like contracts, another dimension of stability that encourages competitive aggressiveness in developers. Two other factors, according to Moss, favor continued growth. First, 76 percent of Brazil’s electricity comes from its rich hydropower resource and Brazilian wind’s variability perfectly complements the base load hydro supply. In the wind-rich northern and southern regions, there is an almost ideal match between wind and hydro, Moss said. "The best wind times are coincident with the worst water flow." During times of drought, this is particularly fortuitous. Beyond this “complementarity,” Moss added, “We have an almost fully interconnected transmission system” and “the wind in the south is wholly complementary to the wind in the northeast.” With this robust 200,000-kilometer grid, wind-generated electricity can be moved around to minimize the impacts of variability. Where there are wind resources far from a grid interconnection, the Energy Ministry encourages developers to share the cost of building one. “Every year we connect more of the country,” Moss said. Can Germany’s North Sea Winds Blow Away Nuclear? Will the money keep coming for billion-dollar projects like ABB’s world’s-biggest HVDC transmission? Power and automation provider ABB has won an approximately $1 billion order from Dutch-German transmission grid operator TenneT to build the world’s largest offshore HVDC (high-voltage direct current) system. The system, planned to go operational in 2015, will connect Germany’s offshore North Sea wind farms to its mainland grid. The new ocean transmission system is another major step forward in development of the offshore wind power the Merkel government will need realize its ambitious, recently announced plan to abandon all nuclear power generation by 2022. Germany intends to double its present 27 gigawatts of wind capacity -- eight percent of its electricity requirements -- by 2020. Much of the new capacity will have to be offshore because so many of the available land sites have been used. Skeptics say Germany can’t build enough offshore wind and other renewables to free them from nuclear power, and many have opined that the decision to abandon nuclear will result in more coal consumption, the purchase of French nuclear-generated electricity and higher German electricity bills. However, these skeptics may be underestimating the viability of Europe’s offshore wind industry. 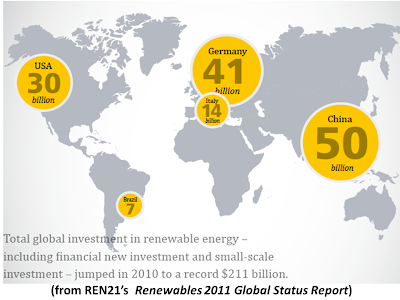 In 2010, 2.6 billion euros were invested in offshore wind, according to the European Wind Energy Association (EWEA). The list of banks willing and approved to provide capital for European offshore projects now numbers over 20 and is growing rapidly, EWEA reported. Banks are expected to serve up a record three billion euros for offshore wind farms in 2011. EWEA estimates investment in offshore wind will be 10.4 billion euros in 2020 and 17.1 billion euros in 2030. The recently announced KfW Bankengruppe program alone will provide five billion euros to 10 German projects. Support from Denmark’s EKF export credit agency and the European Investment Bank (EIB) is expected to continue, and the recently started U.K. Green Investment Bank is expected to be active in the sector soon. 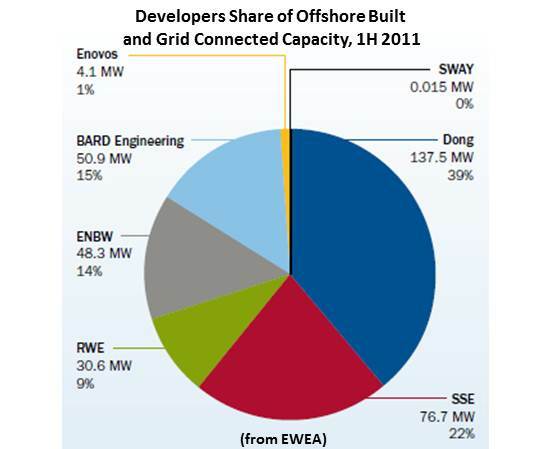 Europe built 4.5% more offshore wind in 1H2011 than in 1H2010. 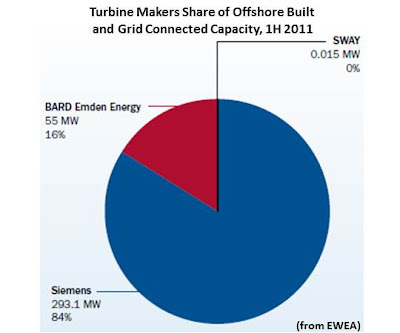 The U.K., Germany and Norway built and connected 101 new turbines offshore with a capacity of 348 megawatts. This brought Europe’s installed offshore capacity to 3,294 megawatts (49 wind farms in nine countries with 1,247 grid-connected turbines). Eleven more offshore wind farms, representing a 2,844-megawatt capacity and a total value of 8.5 billion euros, are under construction. EWEA estimates Europe will have 40 gigawatts of installed offshore wind capacity in 2020 and 150 gigawatts in 2030. The highly efficient 320-kilovoltHVDC lines, which limit electrical losses to less than 1 percent per converter station, will take the power generated at Gode Wind II and other wind farms to an offshore HVDC converter station. From there, the electricity will be transferred via 135 kilometers of underwater and underground cables to an onshore HVDC station at Dörpen on the German coast, and from there will travel to the mainland grid. The ABB transmission system is the kind of advanced technology and advanced capability the European offshore industry is ready to build, and it suggests that the Merkel government was not acting out some irrational green ideal when it shifted its commitment and priorities away from nuclear power. Merkel, a physicist before she became a politician, can understand better than most world leaders the implications of such a technological capability. Her insight into offshore wind’s potential is no doubt buoyed by results from Research at Alpha Ventus (RAVE), a remarkably comprehensive public-private research program initiated in 2006 and built into the North Sea construction of the 60-megawatt Alpha Ventus wind farm, the world’s first deep water offshore wind project. Interestingly, the other world leadership that is shifting its priorities to offshore wind is that of China. Eight of the nine members of its politburo began their careers as engineers. The Chinese government recently announced that its preferential supports to wind turbine manufacturers will not be extended to those without the capability to turn out turbines at an offshore-wind-sized (2.5 megawatts or greater) scale.